Moving your photos from Aperture to Lightroom is not difficult. Your adjustments won’t translate (workaround here), but moving to Lightroom certainly doesn’t mean losing control of your picture collection or sacrificing all the keywords and other metadata you’ve added in Aperture. As background, I should say that I have never been a full-time Aperture user – I’ve always preferred Lightroom – but I was invited to Aperture’s UK launch, have owned each version since 1.0, used it for individual projects, and as an author of books on digital photography I needed to understand how to make best use of mainstream programs like Aperture – just in case a publisher came knocking. So over the years I’ve been able to help many people move to Lightroom. This article has been updated many times since I initially wrote it, and some great comments from readers describe specific problems people encountered and provide valuable insights – as well as corrections to my text. While it’s very hard to find the right balance of overview and detail to suit every reader, I really hope it helps you. Don’t rush. Aperture will keep running fine for a year or more – I wouldn’t move any faster than suits me. Lightroom isn’t the only escape route. CaptureOne is good, though its cataloguing remains weak compared to Aperture or Lightroom. The best method to move your Aperture work to Lightroom is with Adobe’s new Import plug-in. You can also move your work with the old manual method. 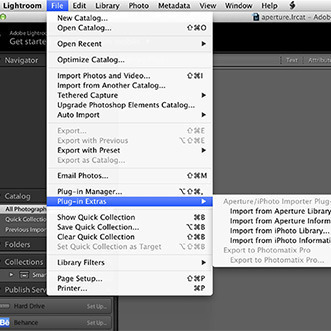 Lightroom’s import tool is launched by the menu command is File > Plugin Extras > Import Aperture Library. If you’re worried about how Lightroom will handle your Aperture projects, read this article. Review how you have been using Aperture to store photos. Have they been “managed” or “referenced”? For “managed” photos, Lightroom’s Import from Aperture process will always make copies of those pictures and put them in new date-based Finder folders (YYYY/MM/YYYY-MM-DD). I recommend you use Aperture’s own Relocate Masters command to switch your “managed” photos to “referenced”. For “referenced” photos in Aperture, the Import tool’s default behaviour is also to copy your photos into new date-based folders. I’ll say more about this later, but referenced is fine. Back everything up again, or ensure that your backup will allow you to restore the situation before attempting to import your photos into Lightroom. Now in Lightroom, the process is very simple and begins with the menu command File > Plug-in Extras > Import from Aperture Library. For “managed” photos, Lightroom’s Import from Aperture process will always make copies of those pictures and put them in new date-based Finder folders (YYYY/MM/YYYY-MM-DD). If you don’t like that structure or don’t have enough hard drive space, I recommend you use Aperture’s own Relocate Masters command to switch your “managed” photos to “referenced”. You can choose your own folder structure. For “referenced” photos in Aperture, the Import tool’s default behaviour is also to copy your photos into new date-based folders. Again, you may not want that, or have enough hard drive space. In this case, choose the option to leave the photos in their current folder locations. I wouldn’t change the other options, apart from perhaps the top one. This imports small JPEG files showing how your pictures looked in Aperture. Once you click Import on the main Import from Aperture dialog box, just wait while Lightroom copies any pictures and then proceeds to import your projects and albums into its Collections panel. What if it goes wrong? I’ve heard a few reports of the conversion process not completing, though I haven’t seen this problem with my own eyes. It’s not surprising though. After all, Apple never helped Adobe’s developers figure out what’s going on inside Aperture libraries! If you do hit a problem, my guess is that it’ll be something annoyingly simple – like odd text characters in metadata – which you may be able to fix in Aperture before doing the import again. To see where the problem happened, in your Documents folder should be a LibraryImporter.log file. Double-click this file and it should open in the Console application, and the most recent entries might reveal what’s going on. Before Adobe introduced its Aperture import plugin, you could transfer work manually, and this is how I used to recommend you did it. I would suggest that your first step should be to become more familiar with Lightroom. For instance, choose a date such as the end of the month and then import all new pictures into Lightroom, continuing to use Aperture only for earlier images. During this period, you’ll gain more experience of Lightroom and moving your older pictures from Aperture will be very much easier. Lightroom only works with files in regular Finder folders. So it’s very important to make sure that in Aperture all your photos are “referenced”, that is in normal Finder folders rather than “managed” inside the Aperture library. Aperture’s File > Relocate Originals (“Masters” in earlier versions of Aperture) is the menu command to move any managed files from the Aperture library or vault and put them into regular folders. Choose a folder in Pictures or somewhere sensible, and then tell Aperture how it should create subfolders. If you want your Aperture project structure to be reflected in the new folder structure, or want a date-based folder structure, Relocate Originals / Masters has suitable options. Once the files are in regular Finder folders, you can import them into Lightroom. But hold on a bit…. It’s quite easy to translate an Aperture keyword hierarchy – you just need to do it before importing the pictures into Lightroom. 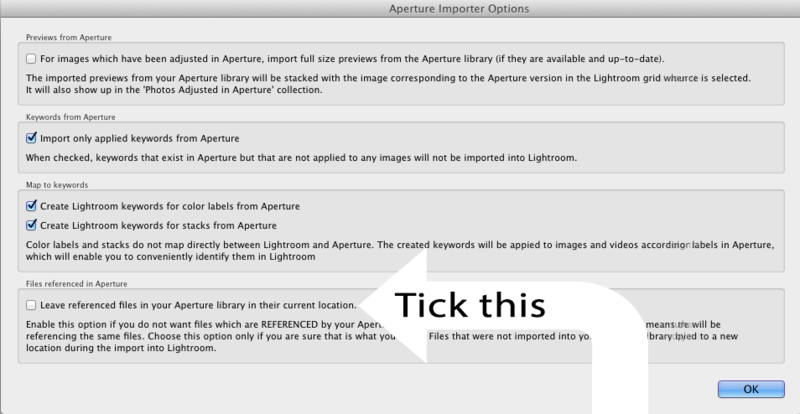 Your Aperture keyword hierarchy should now be exactly reproduced in Lightroom. When you start importing the pictures into Lightroom, it will match their keywords to the hierarchy you’ve just imported. The one problem will be where the same keyword occurs more than once in the hierarchy. For instance, in Aperture the keyword “Packhorse Bridge” may be under “Lake District > Valleys” and also under “Architecture Bridges”. Unless I’ve missed something, Aperture doesn’t save this information into the images and Lightroom can’t work out which keyword to apply and instead creates a new top level keyword. But this is a detail that will only affect a few users – just be aware of the issue. Colour labels – the easiest way is to select all the files with each colour labels, add the colour as a keyword, then use that keyword to reapply the labels in Lightroom. Custom fields. Lightroom doesn’t allow you to create your own custom fields (workaround here) and you’re probably going to need to run an AppleScript inside Aperture to copy custom field values to standard IPTC fields. The obvious one would be keywords, and in general Lightroom users tend to use keywords for data that that Aperture users often store in custom fields. This article discusses the issue and there’s a script here which could be adapted to copy from custom fields. I am no AppleScript expert but I have an script which handles the colour labels and the flags. If you want to try it at your own risk, let me know, but the manual methods do work. Things can go wrong whenever you move between any systems. You may misunderstand something, do something genuinely stupid (we all do! ), or you might run into a hardware problem such as lack of disc space. It’s always easier to proceed with a migration if you are confident that you can just go back to square one and start all over again, having done no harm. That means having everything well backed up, so I recommend you should run a complete backup of your Aperture library and your pictures. Also, backup is no good if you don’t validate it or know how to recover files after a problem. So take the opportunity to make sure everything is indeed being backed up, and try restoring some files to prove you know how to use that part of your backup program. Lightroom can read your Aperture keywords and other metadata and you should be able to transfer almost everything else such as captions, titles, ratings etc. There are exceptions such as colour labels, custom fields, and GPS co-ordinates applied in Aperture for which workarounds are needed. Essentially you have two alternative ways to get metadata out of Aperture, and you should think through both of them before proceeding. Also keep in mind you need to handle raw files differently from JPEG, DNG, TIF and PSD files as they shouldn’t usually have xmp sidecars. Aperture 3’s menu command “Write IPTC to Master” writes keywords and other metadata directly into your photos. You should use this method for JPEG, DNG, TIF and PSD files, and can use it for raw files if you wish. This is the more straightforward method though is only available in Aperture 3. You just select the pictures and choose the command Metadata > Write IPTC to Master command. This writes the metadata directly into the masters, and Lightroom will read it when you import the files. You should use this method for non-proprietary file format such as JPEG, DNG, and TIF and also for PSD files. You may also use it for proprietary raw files if you wish, and if you are certain you do have reliable backups of all those files. I urge some caution because these pictures are in proprietary file formats, which means more danger of Write IPTC to Originals (Masters) causing some kind of minor but very-annoying file corruption. In fact, in Aperture’s early days Apple had advertised that it never touched your raw files. On the other hand, if you have your pictures properly backed up there probably isn’t much risk. An alternative method can be used in Aperture 2 or 3. It is the safer method, and is generally the way I recommend for raw files, but it does require much more disc space as it creates copies of your master files. This is essentially what the Aperture Exporter app does. Just select the pictures and choose File > Export > Originals (Masters). You can make the export into new Finder folders which match your Aperture project structure – that’s the Subfolder setting. In Metadata you should choose the option to write IPTC XMP sidecar files. These files will go into the folders next to the images and allow Lightroom to read the keywords and other metadata that you entered in Aperture. So it avoids the need for Aperture to write the metadata directly into proprietary raw files. Identify adjusted images by using a smart album. Adjustments made in Aperture do not convert into Lightroom adjustments – and vice versa – because the adjustment sliders are too different or have no equivalents in the other program. If you use option 2, it probably makes sense to find all your adjusted images by creating a smart album. In Aperture’s Library section, select Photos, then File > New Smart Album and click Add Rule. Choose Adjustments and “are applied”. Your pictures are now in regular folders and have as much IPTC metadata as we can rescue from Aperture. You are now ready to import the pictures into Lightroom, a process that’s very similar to importing files into Aperture in referenced mode or “in their original location”. I like to drag a folder from Finder and drop it in Lightroom’s grid. This opens Lightroom’s Import dialog box and automatically sets the source to the folder you’ve just dropped. Make sure you choose “Add” in LR’s Import dialog. This leaves the files in their original location and is most helpful if you chose method 1 since it leaves the files where Aperture knows they are, just in case you still need to use Aperture for something. Also, perform a careful review of what you’ve imported into Lightroom. For example, does Lightroom now show the same number of master files as Aperture contained? If there’s a difference, find out why that has happened. Have you not imported some folders into Lightroom? Have some file types failed to import? So it’s not quite as difficult to escape from Aperture as you might have feared – Apple, surprisingly for them, made it rather easy. I have tried to import from Aperture and the sport dialogue box stops when it shows 32% or 50%. So not all of the pictures are importing. I read what you said about looking in the documents folder but there is nothing in there pertaining to this transfer. I ticked all the boxes. The files that have been transferred are linked to the raw files on my external hard drive where Aperture is linked to them. What else can I do? Thanks for the article – I didn’t realize there is an «Options» menu in the Importer and copied all my masters at first 🙂 Now on the second run while leaving the masters referenced. Still relevant in 2019, who would have thought. I’m a Lightroom user for years now but only now got to migrate my legacy library. It’s such a pitty they didn’t manage to convert the non-destructive edits. I tried to move my aperture to LR, it said it would not accept anything Aperture less than 3, my version is 2? how can I resolve it? My first suggestion would be to see if the ApertureExporter tool works with 2, but you can only move to LR the old manual way (above) . thanks for sharing but i have some problem when i try to import my iPhoto library to lightroom. In fact when i use the import plugin and try to import my big library(80gb) this process takes a long time. I have left for more than two days on my Imac and then when i check the progress is always stopped at 9%. What might be the problem? I really have to wait more than 3 days to import my library? Thanks for your kind answer. 3 days is far too long! But I can only guess at why it sticks at 9%. Assuming you have lots of disc space, there will probably be something unusual in an image’s metadata. But finding it is very difficult. I’ll ask someone if there is any logging tool that might help. Thanks very much for your kindly answer. I hope in a positive response. The strange thing is that I have also disabled the option of the importation of the metadatas. Do you have enough disc space, Alessandro? My idea is that Lightroom will need at least 80gb free because it will want to copy the photos from iPhoto (I don’t really know iPhoto and think it puts all the photos inside the library). Also, what version of Lightroom are you using? yes I have enough space in my HD and i use the last version of Lightroom CC 7.01. Thanks. I’ve been told to suggest that you try it with 7.1, Alessandro. I am not sure why, but let’s see. Sadly, Apple didn’t help Adobe create this conversion tool! i try to update Lightroom and let’s see if this works. I’m having similar problems consistently stops at just 5%, the import LR bar shows no activity after a while and stopped at 993 images. I am using Ap3.6 and LR Classic 7.1. Library is ~100GB with ~20k images. Thank you for all this information it has been really helpful. I have been using Aperture since it first came out and am now learning LightRoom(kicking and screaming) My major concern is I have two hour slide show in 15 segments or individual slide shows varying in length from 1minute 15 seconds to 11 minutes 30 seconds. All set to music and some with multiple tracks and all the transitions, and dissolves. This was a years worth of work. That I am terrified of losing. I have tried exporting it as quick time movies with limited success and in that form I don’t have the same type of control when I am presenting. So . . . my question is what will happen to it when I move my Aperture library to LightRoom? Hope you have some suggestions/solutions. Thanks. Two days ago, I launched Adobe’s plug-in for “Import from Aperture Library” based upon tips you’ve provided in your blog and using Laura’s 14th video (FAB series) entitled “Import from iPhoto” as a guide. Both proved to be very useful. Before launch, I converted my Aperture photos from being “managed” to being “referenced” so that LR6 could read my NEF, Tiff, jpg, and RAW files. It took more that 1.5 days for the plug-in program to import about 27,000 images. During the import process, I saw photo images come across my computer screen while LR was open, indicating that all was proceeding well. To my surprise, the photos imported into LR are not visible The photos in my Aperture “Projects” and Album folders in LR’s “Collections” are blank. Even when I drill down to the YYYY/MM/YYYY-MM-DD Lightroom’s default structure for its plug-in, the imported images are not visible. For example, the 2012-01-21 folder indicates that there are 24 images in it. In grid view, these images contain my star ratings. But they are totally blank. What in the world could be the problem? So importing a large Aperture database(370GB) into LR using the plug-in. After a week, it is stalled at 58%. I can still see every minute or so Lightroom record that it is importing a new photo, but the rate at which it is doing this is dropping dramatically. Is this usual? Is there something I should do? It is unusual. But what options did you choose? I read the directory, and go straight to Import tool section. never read any other. but now looking closely, IPTC isn’t imprted? need writing ?? Doesnt’ “Aperture keywords and other IPTC metadata” section and after belong to “old method” section? or does “Aperture keywords and other IPTC metadata” means some special IPTC? I resolved a problem with Lightroom auto-import not getting my RAW files out of Aperture. I used the manual method described here and everything was fine. Have been dealying import from Aperture to LR. Have made many tests, not great but I can make most corrections later (35,000 photos). I reorganized and renamed so all File names and version names are the same, so that the LR file structure will work better for me. My question: When imported, a great many items also have a duplicate saying “Aperture_preiew jpg”. Exactly what’re these, and can I safely get rid of them? These should show the appearance of those images in Aperture, Arnie. So they allow you to print or output the images as they looked, but without needing Aperture. If you want to delete them, you can. help required. As I need a new computer, I finally have to move away from Aperture, though I’d rather not would, as I am used to the workflow. Anyway. Last week I made all all my Aperture library of 1.5 Terabyte (99 % referenced files edited with external editors) clear in terms of fixing permits, preview files and such. Took about a week. Tried to import library into Lightroom on the weekend. Started after another 24 hours of checking Aperture library by Lightroom. After starting import, it stopped after importing 30! pictures due to some error. Returning to Aperture the bad surprise was that Lightroom had dome something to the Aperture library – it could not be opened by Aperture anymore. After installing the last backup pre-Lightroom import Aperture thought that the library had to be set up new completely. Now back to calculation preview pictures. Structure of the library seems to be ok, though. I’ve never seen any cases where Lightroom has corrupted the Aperture library. If the automatic way doesn’t work, try the old manual method. Good luck. I was as much surprised and still wondering, especially after that very careful preparation. The whole issue is such a tedious affair. Nevertheless thanks for encouragement. Thank you very much for this website and your support, this is very helpful and greatly needed! The problem I have is that Lightroom does not import my keywords, although the files in question are Canon raw files and I export the originals with the ITPC sidecar option. I did not touch the metadata presets. Any suggestions as to what I may have missed? So you are absolutely sure you did not specify a metadata preset in Lightroom’s Import dialog? I think you need to verify what is coming out of Aperture, as well as what Lr might have done. So maybe focus on a sample of files that have arrived in Lr without keywords. Select a photo in Lr and use Cmd R to look at that photo in Finder – is the sidecar file present? Might it not have exported from Aperture? If it’s there, is there anything odd like a non-alphanumeric character in the file/folder path? If it looks OK, try using Metadata > Read Metadata to make Lr read the IPTC sidecar again (it should have raad it first time of course). One other thought is if you ever used Aperture’s write metadata command to write the IPTC directly into the raw file. This might conflict with the sidecar, and Lr might be preferring the “wrong” metadata. And yes, backups never, ever hurt. thank you very much for your support. I checked everything according to your (excellent) suggestions – however, to no avail. On the brink of despair I then decided to go way back and use one of the backups I had made before attempting to use the LR plugin method. That version was short about 300 photos (plus keywords etc.) – which was why I did not want to use it in the first place. But: lo and behold – now the keywords, star ratings and even the color labels (!!) were there! I have since made several test runs with batches of files and they all imported without a hitch, including all the metadata. What exactly caused the problem is not clear – but it seems to have to do with the failed attempts to import my Aperture files via the LR plugin. At any rate, a large library (mine is 1.56 TB) cannot be imported in one sitting without serious risks. What is more: I had specially prepared a smaller Aperture library for testing purposes but he plugin started opening the main library without letting me choose that smaller library. Thanks again for your advice! This is a great how to, thank you. I’m in a bind though and I don’t seem to find anyone who is in a similar situation. I had two libraries, one iPhoto and one Aperture. The iPhoto library was managed and the Aperture is a mixture of managed and referenced. I read somewhere that the best way to prep for import was to first merge the iPhoto into the Aperture library before making the import to LR. Wow, big mistake. For some reason, I now have over 6K images that Aperture can’t find and most as I look are in the iPhoto library. No luck using the locate referenced files because I can only do 1 at a time. For some reason, the batch relink all button will only do one at a time. My concern is that now if I try to use the import function i’ll have a bunch of referenced files that don’t import because aperture can’t find them. If I do a import for both the aperture library and the iphoto library i’m going to have the same problem, plus duplicates. And then, how do I make sure I get the referenced libraries as well because those are additional folders that live outside the library. I thought about going old-school and just navigating to the iphoto and aperture “Masters” folders and using those to import from as I’m assuming those are just the originals from the managed library and not the referenced. Then I can manually add those, plus the other folders I have that are for the referenced library. Is that the best approach so I don’t end up with dupes or photos that can’t be found? Maybe it’s time to step back to where things started to go wrong? So restore your iPhoto and Aperture backups, take a breather, then import them individually. But when two programs are managing your photos, and especially mixing referenced and managed, there’s plenty of scope for confusion and duplication. I don’t think there’s an automatic way to resolve it – you’re going to have to test, review what’s happened, and have solid backups that let you make mistakes without too much pain. I am coming to your site very late and hope it is not too late to ask this question. When I export my original raw files to a folder on my desktop and then open them in Photoshop, they open in PS Raw and are 8 bit files. When I export the originals directly from Aperture to Photoshop, the raw files are 16 bit. I don’t want my 16 bit files reduced. Why is this happening and is there anyway to get around this problem. After spending several hours moving files before noticing this, I have now stopped and don’t know how to move forward. Thank you for the huge amount of work that you put into this site! So generous of you. That’s really a Camera Raw question, Joyce, and there are a few ways to get raw files to Photoshop. If you are indeed exporting the raw files to a folder on your desktop, make sure you review the settings in Lightroom’s Export dialog box. It sounds like 8 bit is chosen there. Is the best method suggested (Adobe’s Import plug-in), event better than the Aperture Exporter from Bluepill app? Witch one is more complete/best? Is there any comparative chart so that we can see their features side by side? Migration seemed to go fine, and I can see all the folders in LR. However, it seems to have doubled the storage used on the HD. I guess the files copied to another location? Is that correct? So – big question – can I now remove/delete The Aperture library to free the space on the HD? Thanks so much. Your help is amazing, really appreciated. Doubling the storage space is what I would expect, Pascale, and it happens because you weren’t able to convert the catalogue to referenced. Lightroom needs the photos to be referenced, and its import plugin duplicates the files so that your Aperture library isn’t damaged. You can now remove the Aperture library – backing it up somewhere safe. Before doing so, do some spot checks. Just common sense things like does the number of raw file in Aperture match the number in Lightroom. Do images have all the right keywords? And so on. I want to import my Aperture libraries into LR. I have a 3TB external drive. LR popup says that I don’t have enough space to do so: 1,149,865 MB required but only 672615 available. How do I handle this? Use the Lightroom options to leave referenced files in their current location? I’m currently dealing with migrating an Aperture library to Lightroom for work. My question: Is it possible to import an Aperture library that is, say, stored on an external hard drive into Lightroom without actually having Aperture installed? We have a massive library of photos that was developed a few years ago, but there is no way to download Aperture now to access them. If my Lightroom can find the Aperture library, can it still import it? I believe that should work, though I’ve not tried it myself, Alicia. By the way, Aperture should be available in the Purchases section of the Apple store. Hey John. Hope you can advise me. I have an old 2006 24″imac.The graphics chip went down, a common fault on this model. Fast forward to now, I’m now running a windows lap top. Question: Can I just extract my imac hd, transfer the contents onto a flash drive & access my Aperture library via light room that way? Lightroom’s Aperture plugin won’t work on Windows. Another problem would hit you if Aperture has any “managed” photos – on Windows it would be difficult (a manual exercise?) to get them out of the Aperture package. So my recommendation would be to get access to a Mac for the changeover (maybe read this recent thread). I just recently purchased a new Macbook Pro, and bought Adobe Lightroom 6 for it. The old Macbook I have has Aperture and all my pictures. Any suggestions/recommendations for how I move the Aperture library into Lightroom from a different computer? I’m all sorts of confused. hi. I am relocating my originals from managed to referenced on an external hardrive. If I want to import this aperture lightroom library into Lightroom on a DIFFERENT harddrive, do I hit “copy” instead of “add” on import? Not really. What you are suggesting is a regular import – but you should be using File > Plugin Extras > Import Aperture. If you really want to do what you suggest, the “copy” option works as you think. It’ll allow you to copy everything to another drive. Aaaah! Thanks, now I understand. This sounds good to me. So this way, I can transfer the originals to another location. Does this in the end mean, that the selected project became a “referenced project”? My idea was, the first step is to convert the whole library from managed into referenced. Then move some project folders to an external disk (somehow, that Aperture knows where they are located then newly. Afterwards, having all masters/originals extracted from the library package to a “normal folder”, I could fire up the Lr import plug-in. With the aim, to use Lr as well as Aperture with the same originals. What do you think about this? That’s right. Your Aperture projects would all become referenced. Aperture and Lr would then be using the same originals – providing you choose the import plug option I recommended. I am having to bite the bullet and move to Lightroom at last. Unfortunately I am already using 400 gB of a 500 gB hard drive with 250 gB of that photos (and currently running Snow Leopard). Do you know if I will be able to get Lightroom to copy the ‘managed’ photos onto an external hard drive and use that in the future to give me more space! I will obviously have to update to El Capitan before I do anything else to even get Lightroom installed! Lightroom would be able to copy, but why not avoid that (which will be slow) by making everything referenced in Aperture? Then Lr would be able to use the option to import in their locations. You can never have enough disc space, or too many backups. I’d focus on this first. or first copy and then delete it? I am asking, because my rMBP SSD disk space is low (1 GB available, 213 GB Aperture Library from total 250 GB). Moving would work for me, but copying is not possible. Hard to know without trying it. My guess is that Aperture will move (ie copy and delete) one photo at a time, rather than moving the folder as a block. But in any case, aren’t you working on too little free space? You might want to look at that issue first, maybe adding a Thunderbolt hard drive? I am definitely working on too little space. I alredy moved any other folder which is not a system folder to my external HDD. The only file left, ist the big package of 213 GB Aperture Library. I am not sure, how to split it up. PS: Sorry for double post. How to delete the other one? It seems to me that your next step should be to solve that space problem. Do you have an external hard drive? Assuming you do, select a project and use Aperture’s File > Reorganise Masters/Originals command to move that project onto the external drive. The library itself will remain on the MBP, but this command moves the photos from that 213gb and so you should get more disk space on your MBP. Once you understand this process, do it with the other projects. You should then have much more space on your MBP and will be able to use the Lr import plugin with the Options to import photos at their locations (ie not copy them again). When using your suggested command “File -> Relocate Originals”, is it possible to keep Apertures internal folder structure of the managed masters folder? This is only due to better comparison with my time machine backup. I would like to do a “diff” against my backup, if the relocating process was fine. But this wont work, if I cant reproduce the exact folder structure of the managed library. PS: This double post contains an update question and is better sorted in the question hirachy. Sorry again! Many thanks John. Have at last started planning getting moire memory. One possible issue I may have is that my copy of Aperture is version 3.2.4. I was looking at some info on Adobe’s website regarding the Lightroom plug-in which referred to it supporting Aperture versions 3.5.x. Many thanks if you can help here. If you follow the advice to reference the files AND choose that Lightroom plug-in option, then you shouldn’t need extra disc space, Martin. Aperture 3.6 should be available from the Purchased section of the App Store. Simple question – and I apologise if you have answered this already! Is it both the adjustments to RAW and JPEG images that are not carried across to LR or is it only adjusted RAW images which are affected? Lr can’t read Aperture adjustments for all image types, Justine, raw and JPEG and PSD etc. So it will bring in unadjusted images. However, there is an option to import an extra JPEG which contains Aperture adjustments. So for one raw file, you would get an unadjusted raw plus a JPEG showing those adjustments. You can use this JPEG as reference or if you need to share exact copies with someone. Thanks John for your reply. In which relation are those connected to the original, unadjusted RAW images in Lightroom? Will they be stacked to them individually or are they all just collected as a bunch in the collection “Photos Adjusted in Aperture” ? My Ap3->Lr import has been running for 2 days (48 real hours!) and has apparently hung at 37% complete. Lr is no longer getting much cpu, and the display (of thumbnails) is no longer flickering or updating, so I’m guessing it has stalled for some reason. Lr is getting .1% to .4% cpu, whereas during the active import it seemed to be getting at least 80% most of the time. I think I’m dead in the water. If I were to Cancel and restart the import would it resume where it left off, or do I have to delete the Lr library and start over? I’m guessing that the next move is to break up my 52GB Ap3 library into smaller libraries… or maybe I should just stop trying to save all my metadata (after all, I had only manually tagged a couple of thousand photos in the old Ap3 library, sigh) and import the photos from scratch into Lr (or even Photos). I guess there is one more option: If I forced Ap3 to export keywords etc as sidecar files, would Lr accept them while ingesting the masters? It would not resume, so I would suggest deleting the Lr library and doing the old manual method – so the second method listed here. Aperture does have a menu command to save metadata to the files. My guess is there is probably something in the Aperture library or some photo that is causing the problem. Adobe needed to reverse engineer the catalogue and it’s unlikely that Apple helped make the task easier. Hi all… yet another used-to-be happy Aperture user making the forced switch to Lr. My Ap3 library was 52GB, most recently running with Lion on a MacBook Pro. Got a new iMac with El Cap, making the migration to Lr after wasting a couple of days trying to get Photos to import my Ap3 lib. Much googling convinced me that this was a lost cause, so I ponied up the upgrade fee for an El Cap compatible Lr and started the import. The Ap3 lib has been brought to the iMac on a USB drive. The masters are on a Syno NAS drive. They were Referenced in Ap3, so all should be pretty Lr-friendly. I am astonished by the incredible *slowness* of the process. It has now been running about 36 hours and is — get this — about 25% complete. So I am going to need another 100+ hours to finish this import? My library is not that huge, I’m not a pro. It’s all just jpgs from consumer-grade cameras. I realise that the NAS introduces some lag, and so does the USB drive, but this seems ridiculous. Around here in the winter, it’s actually unlikely that I will get 100 hours without a power hit, so the odds on being able to complete this migration at all until, say, April or May seem pretty low. Is this snail-like pace normal? should I can the whole thing right now and move the Ap3 library onto the Fusion drive on the iMac? Or is it the NAS master repository that’s the problem, more than the USB connection to the library? O how I wish Apple had not ditched Aperture…. Over the weekend I used the LR plugin to move my Apeture Library to LR. Everything seemed to work fine but I don’t understand what I’m looking at. All my photos came into the Folders separated by date. In Collections are my Folders how I had my Projects organized in Aperture. I had a Folder titled Year and then all the Projects for that year in each Folder. I thought Collections in LR were basically what we called Albums in Aperture. Am I supposed to import everything from here on out as Collection? I’d just like to thank you for taking the time to go through this. I’ve just successfully migrated over 40,000 images following your guidelines. Whilst none of the adjustments can be transferred directly using the import plug-in, I have my previous Aperture library accessible (and backed up on separate external drives) should I want to use a particular image from the Aperture ecosystem. I stuck with Aperture 2 till the bitter end and now I am trying to migrate to LR6. I am having difficulty. Is it possible to move from Aperture 2 to LR 6? Or do I have to find a copy of Aperture 3 in order to make the transition? No, you’ll have to find a way to upgrade to 3 for the automatic method to work. Do you know someone who could do it for you? Maybe the Aperture Exporter tool will help https://apertureexporter.com/ though I’ve never tried it. If not, most of the old manual method should work. Migrating from Aperture 3 to LR CC2015. I have tried this multiple ways, but odd things keep happening. I have about 53K images in my Aperture library. First, I used Aperture Exporter (from Blue Pill Software) to generate the files that I then imported into LR. The original 1TB size of the referenced files in Aperture got converted into a 1.5TB folder – but I understand that as AE created finished images of the raw files with the adjustments I made in Aperture – so that’s fine. The problem is that the way AE generated the sub folders differs pretty greatly from the way I had stored the original images on the external drive. For instance, I originally had a folder called “Photos 2015″ and inside that separate folders for various events (e.g. – 2015 Jones wedding”, “2015 graduation”, “Misc imagery 2015” and within that latter folder 12 subfolders – one for each month. AE did not hold to that hierarchy, and so the Folders section in LR doesn’t really have things laid out as I would like (and I can’t figure out how to add a Folder into which I can drag the needed subfolders in LR). Of course, in this process all my Aperture Projects were lost altogether. So then I figured, why not start fresh and just run the plugin-import from Aperture menu item right there in LR. This led to a better outcome in terms of the catalogs, which mostly copied the Projects I had in Aperture (and I don’t care about losing the edits I had done so those could be sacrificed). But in the Folders area, two weird things happened: The folder structure appearing in Folders is not a match to the actual folder structure on the external hard drive, and there is also a folder for the computer’s internal drive (where there are no referenced files in Aperture) with dozens of folders, each titled with a date. There is also a folder called “assets” that itself contains a gaggle of oddly named image files – though i think these are from the iPhone shots over the years. When I open these images in the Finder, the path is Pictures–>LightroomMasters–>2015–>11–>2015-11-12–>and 2 images are in that sub-sub folder. So what is this “Lightroom masters” folder in the Pictures folder on the main hard drive? Are they all copies- if I delete them (from within LR) will I be killing images from my iPhone as well? I then attempted a different tack, thinking that perhaps the sheer number of images LR tried to swallow at once was too much. SO in Aperture I selected 2 of my Project folders and exported them as a new library, and then opened that new library in Aperture so it was the default Library that LR would see. Again, everything is on the external drive. When I started with another new Catalog in LR and used the plug in to import this smaller Aperture library, the Collections seem perfect but the Folders section only shows the internal HDD, not the external drive at all! If i try to “+” a folder, it seems LR is asking me to select the source of a new import, and I don’t want that – but I can’t understand why it didn’t recognize the external drive as it did correctly the other times. It is a puzzlement. I did notice that when I create a new catalog, the Import with File–>Plug in extras–>Import from Aperture library menu item is grayed out until I imported at least one image “straight”. And I realize now that the image I imported just to get the menu item working the final time was indeed from the internal HDD. Could that be why LR doesn’t recognize the external HDD at all in this catalog? Many apologies for this very long post – but I am running out of ideas and cannot find anything as to what that “Lightroom masters” folder inside the Pictures folder is all about either. Sorry about the delay answering – I’ll read and try to get back to you soon, Bob. I am preparing to move to Lightroom from Aperture and have recently installed the version 6.3. I began using Aperture when it was first launched, and have found it to be very intuitive compared to Lightroom. Having said that I am approaching the “managed” libraries conversion with much trepidation. I use many Aperture plug-ins for editing my photo’s as follows; Photomatix, OnOne, Topaz, and DXO as standalone. I have multiple Aperture Libraries and about 100,000 photos or more, with many versions of the same photo via Aperture adjustments, but by far…mostly plug-in adjustments. Considering multiple managed libraries, more than 100,000 (very conservative estimate) photos and adjustments made in multiple programs all stored in the Aperture Libraries, what in your opinion is the best way to convert my Aperture Libraries so that I can use them in Lightroom? Thank you in advance for your advice. Firstly, review your backup system and reassure yourself that you could recover if you had a crash right now, before moving. Knowing you can easily get back to your starting point makes it easier to move on. One Lightroom library (“catalogue”) can contain way over 100000 photos, and I often work on one that is over 600000. However, you can use multiple libraries, so you may prefer to convert one, work on it, and then move the others when you’re happy. By default Lightroom’s Aperture plugin will copy everything from managed libraries. Choosing that default will mean you’ll need spare disc space, but will be less scary. It’ll also allow you to do a test migration, gain confidence, and then do the migration for really. Alternatively, if you want to control the folder structure, copy an Aperture managed library and convert it to referenced, then convert it to Lightroom using the option to leave files in their locations. Again, it makes sense to do a dry run. Before importing “Disable” any Accounts you may be connected to. When you “Disable” these account in Aperture it will remove the copies or previews that are in Aperture. If anyone finds empty projects titled “_1_2_3…” etc. after the import I suspect it’s happening because the user is still connected to Flickr or some other online account. Reimported after doing the afore mentioned and also cleaned up some Recovered photos directories in Aperture but still see those empty projects. Perhaps they are some sort of temp directories for the import process which are not getting removed? No idea what those Recovered folders may be. I’ve not seen this word used anywhere in connection with Lightroom. John, I do understand. My Aperture files are all “managed” in the library, so the import should work. Thank you for your response. John, I am converting from Aperture to LR and replacing old Mac with new at the same time. Can I simply copy my Aperture library onto a separate hard drive and then direct LR to that drive for the import? I don’t want to install Aperture on the new computer. Bruce, yes, that should work. I am 99% certain that Aperture doesn’t have to be on the new computer. Are you confident you know the difference between “managed” photos (which are in the Aperture library) and referenced photos? I am retired and old enough to have trouble reading and comprehending all of these messages and directions?. I don’t understand Aperture as well as most writers here, but I make it work. You have scared me out of migrating. I want to continue to use Aperture as a file system and export to Photoshop essentials or other apps, and back to Aperture. I’m realizing that anytime I upgrade the OS I will need to guard that Aperture is not knocked out of my apps package. That happened to my Air upgrade. I am processing photos using an almost vintage Mac Book Pro and want to replace it with a mac mini. My photos are on 2, 1TB external HDs with over 60,000 pictures (raw+jpg)over 1.5 TB. There are no prizes for switching from Aperture any sooner than suits you, Ken. If you don’t feel like migrating, just continue with Aperture. I have heard of Apple support offering advice and help to get Aperture running on new Macs. You just have to ask. Update: Correction, my import attempts with LR from my referenced Aperture library were cutting off at precisely 8,000 photos. I quick google search produced at least one forum comment that LR cannot import folders with more than 8,000 photos. With this in mind. I should mention that after using the relocate original command in Aperture, I noticed that the newly relocated files, annoyingly, had not maintained the subfolder format that I had created in Aperture. So instead of say 5 main folders with dozens of subfolders and projects, I now just had one folder with a 200 or so separate project folders. I spent a few hours diligently reproducing the subfolder structure and organizing; Aperture appeared to track all these changes so everything still worked fine in Aperture. I then used the import from Aperture feature in LR. The post relocate modifications I made seem to have been the root of my problem and were the cause of LR reproducing folder that I had moved and not being able to import photos from the other folders since all the main folders contained more than 8k photos. I decided to restore my Aperture library from a backup and start fresh from a managed library. I followed the same steps again, minus the folder modification and the import process seems to be working now. Hopefully I can recreate the subfolder format again after the import completes. I’m using the latest LR CC 6 trial and am running Aperture 3.6. I converted my managed library to a referred library using the “relocate originals” feature and now I have working referenced library of about 41k photos. I’ve made several attempts with the “Import from Aperture Library” plugin, selecting different options each time attempting to get it to work, but each time LR only imports about 6k photos along with a log file a mile long with the explanation that the other files cannot be imported because they may be offline or not in a supported format. In addition each time I attempt in import with that feature, LR makes duplicates of my file structure, creating dozen of empty folders with the original master folder. The aperture library and master photos are both in the same folder on my internal HD and the images are nearly all jpg. It seems I can import the photos directly to Lightroom just fine with the standard import feature, which brings in the metadata and ratings ok but I’m losing all my albums, which would be extreamly time consuming to recreate. Any helpful solutions would be much appreciated. I’m a photo hobbyist, not a professional. But getting there, maybe. Got some photo trips coming up. Aperture (v3) on my old macbook pro (“Pro”). Bought a new macbook air (“Air”) and discovered aperture is not available for it. So I bought Lightroom (v6). It’s a single license. So question is where to install Lightroom to both make the migration from aperture and to the new computer? If I install it on the Air, the how to migrate from Aperture? Is there a way to export the files and bring that export to a new computer? If I install Lightroom on the Pro and do the migration there, then how to get the Lightroom and it’s new files to the new computer (the Air). I’m assuming I’ll have to uninstall Lightroom from the Pro before installing it on the Air, which means the files will be … gone? Hobbyists are often professionals in their own fields, Jeff, and professional photographers often do what they know will get the job done, not necessarily what’s the best way. To me the ideal solution is to treat migration from one program to another as a completely separate task from physical migration of your work between computers. Each is an important in its own right and you don’t want to lose photos because you are trying to do them together. So I would decide which needs doing first, get it done properly, and then move to the other task. That said, you have more options than you think. First, are you absolutely sure Aperture won’t work on the new computer? There was a 3.6 released a few days ago, and you should be able to download Aperture from your App Store’s Purchases tab. If necessary, Pro Care Dept. at Apple Support have help some people download it – you need to ask for Tier 2 support and have proof of purchase. So you could move your Aperture environment to the Air and switch to Lightroom when you are ready. Alternatively, you can run Lightroom on up to two computers. I emphasize “run”, because you can install as often as you want – what Adobe restrict is the number of computers on which Lightroom is active. Also, remember that while you “import” files into Lightroom, it’s better to think of this as “registering”. Physically, your photos are always in regular Finder folders. This is different from Aperture where import means registering (“referencing”) or bringing photos inside the Aperture library. Lightroom only referencing where the photos are located. try to migrate to lightroom from aperture after updating my os and thus losing my apetureprogram , now everything is in Photo’s …. The importer plug-in supports libraries maintained with Aperture 3.5.1 and later. An older library is currently selected. Please note that errors may be encountered if you proceed. So what version of Aperture are you actually using? Hi John. Thank you and this was very informative. I am planning to make the jump from aperture to lightroom via creative cloud. I have two concerns. 1. Does the adobe plugin also migrate videos that were cataloged into aperture? 2. I am also considering to transition from Mac OSX to Win 8. Is the lightroom library universal and readable to both OS systems? Yes, it does handle videos too. I’m not sure if it brings over as much of the EXIF info as Aperture, though it may vary depending on what type of video. The catalogue is perfectly universal. I often open a catalogue on my PC and then move it to my Mac laptop when I travel somewhere. Followed instructions; migrated Aperture to LightRoom. Problem: How to organize thousands of pics.i.e. After migration, then…what? I’m having trouble with the migration, but first let me describe what I have done. When I open Lightroom CC>Plug-in Extras it shows I have 143,972 MB free, so my first question is where has all the extra free space gone? The disk space required to import all 32,352 files is 322,850 MB so it supposedly has no space and the IMPORT sign is greyed out. Of the Options I have checked Import only applied keywords from Aperture; Create Lightroom keywords for color labels and Create Lightroom keywords for stacks. Any idea why Lightroom does not see the 535 GB i have free? When I go into Aperture>Photos>Select All>Relocate Originals it says “Unavailable original files cannot be relocated.” How do I find out which originals cannot be relocated? Would be easier and safer if I copy my Aperture Library into an external hard drive, delete the Aperture Library I have in my laptop and then import into Lightroom from the external Hard drive? How do I find out which originals cannot be relocated? – A smart album which looks for the offline files? But you may have to ask a real Aperture user. Would be easier and safer if I copy my Aperture Library into an external hard drive… Providing you have a backup, and use the Options button, the previous instructions are fine. When Lightroom imports photos from Aperture it copies the photos from Aperture…. By default, yes. But that’s why I tell you to use Options – see the screenshots (“recommended” and “tick this”). This way, you end up with one set of folders containing your photos, the old Aperture library which contains your work on those photos (but does not physically contain the photos) and a Lightroom catalogue which contains your work on those photos (but does not physically contain the photos). LRDISPLAY is Windows only, do you know of Mac apps that do the same? I have an Aperture Library that’s 330 GB and have 120 GB of unused disk space, can I do the conversion or transfer from Aperture to Lightroom with those numbers? Aargh! I wouldn’t be surprised if there was another plugin, but I can’t think of one. If the 330Gb is managed photos, I recommend using Relocate Originals. Then see the screenshots at the top of this article. If you follow the recommendation to go into Options and leave the photos where they are, you will be fine with 120Gb free – in fact, that option means you won’t use much extra space at all. 1) After I move them following the instructions in the beginning of this web site, can I delete the Aperture Library and function only in Lightroom? Any recommendation on doing this mass transfer? 2) If I do delete the Aperture Library what will I miss? 3) Is there a way I can sync Lightroom photos to iCloud to share them using my existing groups? You can delete it, but I would suggest leaving it for a while. You might want prefer features in Aperture – slideshow remains better than Lr6. I’m not sure about iCloud. I don’t use that feature. Having a screensaver probably requires a plugin like http://www.lrdisplay.com/ – I’ve not tried it or heard much about it. I hope this cry for help will not make you scream but I am an amateur photographer with about 7,500 managed images in Aperture and am trying to migrate to Lightroom using their plug-in and following your instructions. I am stuck for two reasons (1) the number of my images shows up as about 10,000 not 7,500 and (2) Disk space required is about 150,000 MB while disk space available is about 60,000. I am obviously no computer expert but have been using Aperture very contentedly for several years now so am close to panic. Your advice would be greatly appreciated. Thank you. First, by default LR makes copies of all your files, which uses lots of space. So I suggest using Aperture’s Relocate Originals to change all your photos to referenced. Then in the Import plugin, use the Options button to leave the photos in their existing locations. Second, after running the Import you are going to have to review why that difference arises. Break down the numbers – how many raw files in Ap vs Lr, how many versions vs virtual copies etc. Third, review your backup. The above ideas won’t do damage – eg you can reverse the Relocate Originals with the Consolidate command. But having a solid backup lets you make mistakes or change your mind. Fourth, don’t rush. Aperture won’t die tomorrow. I do not understand how you got everything moved. I cannot get the import button to light up. When I called Adobe they said I can not import a Large library. How do i move them? Could it be that I first opened them in Photos that is why I know cannot open them? Hello John, great info here. I have moved my Aperture library to LR5 successfully. I am a bit confused as to what I am looking at in LR. Under Folders, I got photos from Aperture arranged by year and month. Under Collections I got a Moved from Aperture folder with all the photos from Aperture (about 65,000) arranged by the Aperture structure. I want to move the Aperture photos into my existing LR5 structure. Which one do I work with Folders or Collections? It’s not unusual for ex-Aperture users to think they should use Lightroom’s Folders like Aperture Projects. But there’s no equivalent in Aperture to Lightroom’s Folders panel – the nearest you get is the Reorganise Masters dialog box. Lightroom’s Collections are broadly equivalent to the Aperture Project structure, and that’s why the import plugin tries to replicate your projects in the Collections panel. Folders are for managing photos’ physical storage, not grouping and categorising. Lightroom’s date-based folders are fine for this. IPTC fields describe the photos – captions, keywords, job (eg “2014 summer holiday”), the country/state/city/location fields. You’ll probably use these fields more actively than in Aperture – job is a good one to use. Collections are for grouping and gathering photos. Create them whenever you need to collect a bunch of pictures and try to take as much advantage as possible of existing work – eg don’t create a dumb collection of all holiday photos in Italy, but create a smart collection of Job/Contains/Holiday and Country/Contains/Italy. How did you get LR to import such a large libaray? I have been able to load an Aperture library of 19gb into Lightroom. However I have several libraries of over 100gb and I can’t load them. After Lightroom analyzes the file to be imported it doesn’t come up with the photo count. Without the count it gives an error when trying to import. Is there a maximum file size that can be successfully migrated? No limit that I know of, and I’ve heard of some big libraries being imported. I assume that 100Gb consists of the library plus managed images. Yes, that includes the images. I have four larger libraries, 125gb, 214gb, 235gb and 650gb. When I attempt to migrate these the number count stays at undetermined and when I click import I get an error message saying it failed to obtain image version information. I wonder if I have to break these libraries down to a smaller size or migrate them manually? Thanks for this article, John. I have tried moving a huge Aperture library (more than 6600 images) over to Lightroom using LR’s built-in import feature, but it always hangs at 14% completion. Sadly, the LibraryImporter.log file was of no use, either, to find out why it keeps hanging. So, I just decided to do it the manual way. So far, it seems like it will work okay. Amazing how it’s still relevant seven years later, and that you’re still replying to comments on it after all this time. Thanks again! Yeah, this article refuses to die! Great article. Pain that Apple stops with Aperture – but another challenge, another opportunity. The main problem for me with Adobe is moving to their “creative cloud” its too expensive and OTT for me. The stand alone version of Lightroom is however attractive. However, is the new Adobe plug in available for this? I seem to have read that it is from the creative cloud option. Again many thanks and keep up the good work! The Adobe plugin is available in both the standalone and the subscription version, Bob. You must have misread – or been misled! Thanks for a really useful article. I made the call to convert to LR and ran the Plug In conversion. Problem is almost all images transferred twice when I viewed them in LR. I deleted all photos as I don’t want two copies of everything. I can’t see any reference to this problem anywhere else. I’ve not heard of this happening. So each image was there twice in LR? Pick an individual image (or pair of images) and look at each one in detail. Could one of them be the JPEG created from an Aperture version, for example. Sorry I’ve got a basic problem that I just can’t seem to find a straight answer/clear logic for. Maybe its staring me right in the face (and just don’t realize it). I want to make the import from Aperture to Lightroom as smooth as possible, keeping my current folder hierarchy as close to what it is now. Without a lot of reshuffling and potential headaches, which I’ve read a lot about others having– while searching around. How can I make this into a referenced library? What are the appropriate sequence of settings to use (based on my current structure shown above), when I get to the “edit” panel of the Relocate Originals function in Aperture? Totally confused. And scared to muck it all up before even starting up my new LR journey. How big is your managed library, and how much disc space do you have? Would you have the space to make a copy of the library and use it to test the conversion to a referenced library? Whatever you do, your structure will appear in LR’s Collections panel. I have been operating in a dual world of Aperture and Lightroom for awhile – archiving iPhone images (and other collections) with Aperture and using Lightroom for freelance work. I decided to finally make the switch. I finally got the plug-in to work to move one of my Aperture libraries to Lightroom. Aperture lists 54,000 some images – Lightroom did not import all of them there seems to be gaps in the import with about 1/2 maybe less not making the transfer over. I had no referenced files, all of the images in question were contained inside Aperture. Thoughts? Great article!!! I have been entertaining the idea of migrating from Aperture to Lightroom. I started the process last night just initiating the LR Migration tool Plugin to see what options it has. I had to let it run overnight before I could explore the options panel. I have used LR on occasion for a few months at a time since it’s inception but always fell back to Aperture as I fee it has a superior DAM function. Adjustments between the two are a toss up depending on the look you are trying to achieve. I have 189,980 images in my Aperture library (the one I want to migrate at least). Yes just under 200K. The entire library is referenced. External drive stores the masters, NAS has the Master backup, and NAS has a backup or the backup. There is more but I won’t bore you with my justified and insufficient data paranoia. All folders YYYY/MM/DD and all images YYYYMMDD_MyINITIALS_OrigShot#. Everything post 2007+ is Nikon Raw NEFs except iphone backups of course. I am honesty thinking of embedding IPTC info and giving that a shot. Exporting and Importing Keywords. Then Importing all files as Ref’s. I cannot afford to stop working for 2 days while the systems plays the import game with itself… I can handle overnight. It should be interesting. I do plan on using some test APP Libs to see what result I like best. My only question to the community is has anyone been successful migrating a library near this size? An what advice might you have, other than DONT DO IT and Hope Apple surprises us! I do have to admit I am tentative as I will miss the icloud / sharing and syncing functionality as well as face detection. JSTomasi, Did you make this migration from Aperture to LR? If so, how did it go? We have a similar # of images and I have been looking to see if anyone else had tried to do this, and wondering if it worked. I think I would like to make the switch, but I am very nervous… Thanks. Or… John, have you heard of others making the switch with almost 200,000 images? Thanks. BTW, your instructions are what I will follow if I proceed. Thanks for doing this. I have installed a trial of LR and imported via ‘Add’ my aperture library – which is now listed by file and not in the projects /folders . Can I redo this or resort these ? I need them catalogued by plant type/ fruit type as they were in Aperture – not by date or file as lightroom has done it. There are 7950 images in jpeg format . Apologies if this question has been answered on here – you have a very comprehensive help and advice forum, although it has lost me a little. Sounds like you need to take a step back. “Add” tells me that you imported your photos through the regular File > Import Photos dialog. That explains why you don’t see the projects/folders – they would be in Collections. Assuming that’s true, then start over again. LR’s Apple > Catalog Settings > General shows you where your catalogue is location. Show it in Finder (button). Now exit LR and delete the LR catalogue file in Finder. Start LR and it creates a fresh catalogue Then use the File > Plugin Extras > Import Aperture Library and follow the advice in the Best Method section in this article. Have decided to move to lightroom – have been using LR5 over last few months so underrated it pretty well. I’m trying to import from my aperture library using the plug in and have selected the aperture library and also the folder I keep my current LR cat in but for some reason the import button is greyed out. I’ve heard a few cases of this. It seemed a matter of waiting. How big is the library? Are you on the latest version of Aperture? And LR5.7.1? In Documents, is there a LibraryImporter.log file. Maybe look at this. Hi – I read your block and watched a few videos from YouTube to figure out the best way to migrate from Aperture to Lightroom. I decided to keep it easy and use the plug in app. …Migration just finished and it appears that I’m missing over half of my library. Lightroom shows approximately 9K images while Aperture reflects 25K images…. Thoughts on what went wrong? Hard to know – and sorry it took a while to get back to you. Take a look in your Documents folder and examine the file LibraryImporter.log. Try to identify which files haven’t transferred and whether there’s a pattern. Why migrating from Aperture to Lightroom ? What is the benefit ? What are the lacks in Aperture compared to Lightroom ? I really need some advice to really switch to LR. For now, I could just say the adjustments look a bit poor in Aperture. Am I right or wrong ? I don’t think you need to hurry, Philippe, and the benefits are not clear. However, imagine you are sailing on the Titantic and have an opportunity to transfer to another ship. What would you do? first of all thanks for the article: very clear and useful. I write not for a question but to share a problem. I have an Aperture library of about 58,000 photos (40% raw), all referenced (MacBookPro 2008, OS X 10.10.1). Before I started migrating to LR I found a workaround to successfully import the pictures adjusted. In fact I exported versions in jpeg with a suffix, imported again in Aperture and combined them with the “stack” function. The problem is that they are at the third attempt and I have not managed to complete the process of migrating the foto to LR (5.7) using the plugin. Attempt 2): after using the email app, the process is blocked again. Attempt 3): disabled wifi, closed all programs and I started migrating December 10th at 7 PM. Last night (December 11) was still at 71%. This morning at 6,00 had imported 41 260 photos and tonight at 18.00 (after 12 hours) 42250. Approximately 1,000 photos in 12 hours. Is it normal? This time I was the one who close the process because I need the computer to work. I noticed that at the speed of loading pictures is normal at the beginning (note: just load the data and previews from aperture while photos remain where they are), but the threshold of 30000 speed decreases significantly. 1000 photos in twelve hours. Before I’ve begun the process, I’ve set in the previews size preference at “minimum size” but do not know what else I can do. Can you give me some guidance? I confess I am a bit desperate. I wonder if the computer put itself to sleep (the usual power settings). The other thought is about the slowdown. Did you click the option and set the import so it leaves files in the original location? If not, the slowdown might be because LR would copy the files and might run into disc space or transfer speed problems. But look at the previous post by Nathan. You’ll see it can take a long time. Also, in Documents you should see a log file. Open this and see if it reports some kind of problem. Mi piace Roma – 20 anni fa, abitavo nella vicinita di Porta Pia! 24 hours in and I am at 63%. Looks like my raw files are coming across now. I am currently using the plugin and am 12 hours in at 41%. It looks to be working ok, but is definitely slowing down – Iy took 3 hours to get to 35%, and then then 9 more to advance by only 6%. All that looks to be coming over at the moment are low res jpegs. I hope that changes in the second half and my raws start to make it in. All up it took between 36 & 48 hours (I was at work). It seems to have done what it says – colours, faces, stacks and keywords, are all imported with keywords. All my projects and events have come across as Collections – it has made a mess of the labels of a few of them but you can work it out. I think only a fraction of my RAWS actually made it across. After a bit of digging, it looks like where I hade made the jpeg the original in Aperture (so the Raw is sitting behind it), it has only taken across the jpeg. Where the Raw was the original, it has taken that. This may prove to be quite frustrating as I now need to compare my raws in both programs to make sure I can identify what is missing, and then find a way to get them across and into the correct folders, projects, etc, so I can work with them. Not really (sorry not to respond sooner). LR does have a Preference (General) “Treat JPEGS next to raw files as separate photos” which by default is unchecked, which means that when a folder contains identically named raws and JPEGs, only one will appear in the catalogue. If you are absolutely certain only one file is in LR, maybe enable this option and synchronise the folder. But check first. I thought stacks would be imported as keywords, so you could select one file and review its keywords to see if there is a stack keyword – you can then filter the whole catalogue by clicking the arrow to the right of the keyword. But again, check and spend time investigating before charging ahead. Unfortunately, even before checking LR, the files have not made their way into the directory on the HDD. Doing a check now to compare the number of RAWs in Aperture v LR. Ouch, there are 7,312 RAWs in Aperture and only 1,435 in LR. Looks like I am in for a slow tedious manual transfer of them. Obviously Adobe’s import process isn’t 100% perfect, and that’s not surprising – Apple haven’t helped Adobe figure out Aperture’s internal structures. Try looking for a pattern in what has come over and verifying that you imported your real Aperture library (I heard from one guy who had similar differences in numbers because he had imported the wrong library). And take a look in your Documents folder and examine the file LibraryImporter.log where you might see what interrupted the process. The manual transfer isn’t too tedious – and you are in control of it. Thanks for the information! I followed the steps to transfer images from Aperture to Lightroom but no images are in the folders in Lightroom. In LR “collections,” I have a “From Aperture” collection set, with the same folders, etc., from Aperture, but they are all blank. I could not find anyone else with the same issue, so I was hoping you might be able to help. I did very little editing in Aperture, so I would just like to have all my pictures safely transferred to LR, and then I can be done with Aperture for good. Thanks for the awesome article and super thorough responses. I do have a question that I don’t seem to have seen mentioned above. When I check the “leave referenced files in your Aperture library in their current location” box, I assumed that meant I wouldn’t be copying any files. But when I return back to the main screen on the plug-in and select my Aperture library, it seems to think I’ll be moving all of my files. My Aperture library is about 55GB and my open hard drive space is only about 14GB. The import option remains grayed out, I’m assuming because there isn’t enough drive space to copy the files into LR. Guess I’m hoping just to move the files, or connect to them where they are, rather than make copies. Does that make sense? Sorry, I’m sure I’m doing a terrible job explaining. I think I understand, and it sounds like your Aperture library has lots of managed files. Could that be right? Have you checked? Thanks for the excellent article. Very much appreciated! I recently used the Adobe LightRoom plugin to import from Aperture, but it stopped at 43% on two separate occasions. There may be a limit when I hit 15,999 items in my ‘Lightroom Masters’ folder. Have you encountered similar? I have plenty of disk space; not sure why this would be happening short of a bug. I added similar to the plugin blog (http://blogs.adobe.com/lightroomjournal/2014/10/aperture-import-plugin-now-available.html). I haven’t encountered that problem, but my Aperture libraries may not be as good a test as those from “real” Aperture users. Have you got a log file which may indicate where the process is hanging? My guess is that there will be something like an “unusual” character in the metadata (eg Chinese or an accent) or something unusual about an image. So I’d look for those kinds of exceptions. Why 15,999? That isn’t a Lightroom limit. But definitely post on Adobe’s user forum – I’ve heard of their software engineers reaching out to resolve these problems. Kevin, to see where the problem happened, in your Documents folder should be a LibraryImporter.log file. Double-click this file and it should open in the Console application, and the most recent entries might reveal what’s going on. Ok – understood – now…. Thanks a million. Will do it these days – hope it all goes smoothly. Take your time! There are no prizes for getting there any faster than necessary. How right you are – slowly does it! My Aperture masters are relocated on and external HDD. I want to move them onto another external HDD which now has my LR5 images. “The key is to use Aperture to move the masters onto the new drive” and yet “You are going to use Adobe’s new Import from Aperture plugin, aren’t you? In that case you tell LR to import the Aperture library, which makes LR read the locations directly from the Aperture library.”Am I understanding correctly that FIRST I move the images (relocated masters) from where they are (external HDD(1) to external HDD(2) using Aperture, and THEN import them to LR using the new plugin? Sorry for being so dense..
No, there’s no question of first do this, then do that. What I’m saying is that before running Lightroom’s import from Aperture you should ensure Aperture is up-to-date and knows where those photos now are. One step at a time, don’t confuse moving stuff to new discs with the Aperture-to-Lightroom process. Ah OK…Thank you so very much for your patience! John, firstly a big thank you for all the help you are giving here – you make it sound so simple! MUCH appreciated, really. – Both are installed on my MB Air. import my relocated AP3 masters from their external HDD straight to the other (new) one which would already have my LR5 images? Many thanks for any reply you may care to give. I’m not sure of the problem here, but it seems like you are conflating two separate issues – bringing AP3 images under LR’s control, and rearranging your storage space. It doesn’t matter which you do first, and you’re going to have to deal with both eventually, but try to treat them very separately. You can move the existing LR5 pictures whenever you want. I’d probably get this done first. Now for the Aperture images. Let’s say you fix the storage issue first (I assume the new HDD is big enough for everything). The key is to use Aperture to move the masters onto the new drive – so at this point the Aperture library knows exactly where the files now are. Then LR can import the Aperture library and be confident that it’s up to date. Make sure you set the option correctly (the Tick This in the picture above). Sounds logical – thank you very much. I think I would have missed this step as I presumed Aperture already knows where the masters are (on the “old” external hdd) and so I thought I could just hook up both hdd’s at once and import the Aperture images, telling LR to move them from the “old” Aperture location the “new” external Hdd where I would have all my LR pics stored. Thank you once again – your site is a great help. You are going to use Adobe’s new Import from Aperture plugin, aren’t you? In that case you tell LR to import the Aperture library, which makes LR read the locations directly from the Aperture library. What you aren’t going to do is use Lightroom’s regular Import dialog to bring in the Aperture pictures. Not a dumb question. Generally Lightroom sticks more tightly to EXIF/IPTC standards, which can be unhelpful, while Aperture is more pragmatic. In this case, look at the metadata panel and switch it to the EXIF view. Artist shows up (I confirm from my own D800 images) and I think comments are also there (though I’ve not entered them in my D800). Hi, Under “Aperture Adjustments”, you say “If you use option 2, it probably makes sense to…” and then the sentence cuts off. I’d like to pursue option 2 but would like to know what you advise. What does it make sense to do? It might be possible to convert some adjustments automatically, but it would be a huge amount of work and nowhere near perfect. Maybe Adobe’s importer tool will do something to ameliorate the problem, but I think they will focus on metadata. Do you have any recommendation for saving the orientation data when writing the IPTC metadata to original JPEGs — other than to write a script to copy the EXIF data in afterwards, as UltraBob (above) did? I did a test run on a few albums (a couple thousand photos) and indeed, the orientation data for all JPEGs is wiped. I’m not a coding wiz so I’m wondering if there is another way to preserve both IPTC data orientation data when making the move to Lightroom…. Unfortunately not. UltraBob’s solution seems the best one. 1) Filter all photos in Aperture by Orientation. In the Filter HUD, click “Add Rule” then select “Aperture Metadata”, “Orientation” is “Portrait”. 3) Write IPTC Metadata to Originals and import originals to Lightroom, as directed above. 4) Once in Lightroom, filter by your keyword, select all, and rotate all your photos at once so they are properly displayed. 5) With all the photos still selected, go to Metadata > Save Metadata to File. This gets the orientation EXIF data back into your files. If you wish, you can also remove your extraneous keyword now. Fantastic website – kudos to you! I have recently subscribed to Photoshop CC, which includes Lightroom. I have been an avid Aperture user since 2010 and now have quite a collections of photos, about 200 gigs and growing, with my Canon 6D. I have made a note on my calendar to begin the process of building Collections in LR starting 8/1 (great suggestion). My questions is regarding Photo Stream. It’s very convenient today to have all of my iPhone photos in Projects/ Aperture. Any thoughts on how to set up a cloud transfer in LR? I did a quick search on the Q&A and din’t find a similar question. I think this tutorial should work but there are other ways. If you’ve subscribed to CC, maybe try Lr Mobile ? Nice set of instructions which were much appreciated. I decided to install Lightroom and use it for 3 weeks during a holiday on a 2014 1.7 i7 MacBook Air w/4gb ram. How much horsepower does this app need?! Compared to Aperture, nothing, as in nothing, is smooth. Sliders don’t update real time, there’s enough lag that one has to stop, wait, then slide again if necessary. Scrolling the screen is like looking at chaos as the thumbnails jitter all over the place until they settle down. Seriously, how much computer do we need to run Lightroom? As far as editing, its a very complete module. I’m obviously not proficient in it yet. The end results are comparable to Aperture. A big however, is it takes a lot more work. Same image in Aperture, slide the exposure and the entire image was fine. In Lightroom it took me 3 gradient “layers” and the brush to get it the same. While these tools are very nice and I have found a use for them, I’m not getting anything out of them that a simple adjustment in Aperture can make quite easily. I’m back to waiting to see what Photos will bring. For me, ease of use, speed and a nice work experience is a high criteria. There’s a lot Lightroom can do that Apple cannot do. Many of my nits with Aperture are solved in Lightroom. But its not a user experience thats acceptable to me and buying a fully spec’d rMBP is not in the cards just to use it. Having embraced Aperture and spent hours and hours and weeks and months cataloguing, key-wording and adding all such data to over 60,000 photographs, I have no intention of starting again. Life’s too short! I always process for print in Photoshop anyway, so shall just revert to my own, original folders (which I have maintained as back up) for storing and cataloguing pictures. Even if Mac’s new programme is any good, can I trust them to maintain it? I also remember the days of Appleworks and how years of my work is now no longer available to me. So Aperture is now due to join the ranks of the redundant. At least it’ll save me money because I now have no need to upgrade my Mac machine or the operating system, but every incentive to keep it and Aperture running. Perhaps best of all, I still have the option of my dark room and an analogue camera. No problem storing and cataloguing negatives there. And I can still scan them for a digital output. I’m very disappointed to have wasted so much time. The worst thing you could do is take a decision in haste. Aperture will be fine for a few years. But you wouldn’t need to start again if you did jump to Lightroom or Capture One – your keywording etc would carry over, as would many of the organisational habits you’ve acquired from using Aperture. Yes, it’s just typical of Apple to act this way. I’m just surprised they’ve given any warning! Thanks for the info. The fact that all non-destructive corrections made in Aperture are unable to export to Lightroom is a huge deal and should be listed first. You’ve always preferred Lightroom, but it launched 2 full years after Aperture launched. So back in 2005 Aperture was the best choice for pro photographers. Best to get your facts straight. Aperture came out at in October 2005 and had serious deficiencies, while Lightroom appeared in the second week of January 2006. Actually Aperture 1.0 came out on November 30, 2005. But the versions of Lightroom that appeared in 2006 were public betas. Lightroom 1.0 was released January 29, 2007 (by then Aperture was at v1.5.2). January 9 2006, not 2007, and it’s not relevant that it was first released as a public beta – it was perfectly usable. So Aperture was only alone for a few weeks, and at that time had the dreadful managed-only library. John: I’m not trying to pick a fight here, because I appreciate everything you’ve done on this site, and I find your continued interactions with posts very helpful and quite generous. But I gently dispute the proposition that a beta version is “perfectly usable.” By definition, it is unreliable, subject to change, and issued to get feedback on flaws. If by “usable” you mean “can function and generally performs the tasks that it proposes to perform,” I’ve got no argument. But if by “usable” you mean “reliable, backed by its authors/publisher, and suitable for committed adoption as an application of choice,” I don’t think a public beta fits the description. Well, the beta version of LR that came out in Jan 2006 did meet your first definition, and some of your second in that it was reliable. It just wasn’t “suitable for committed adoption” but only because Adobe had time-limited the program and they themselves weren’t committed to supporting it until it was fully released. “Beta” has a few meanings and is probably used more loosely nowadays, but the key point is that while that LR was called a beta, it was perfectly possible to compare it with Aperture and decide which I preferred. As a word of caution, I exported one project to test this out and ran into issues for photos where I had let Aperture modify the original/master. I picked a project where my camera time was wrong, and had updated the timestamp in Aperture and written that to the masters. When I use those masters outside of Aperture (either via exporting masters or putting them in referenced locations for Lightroom to import), the orientation field is reset to Horizontal. The same occurred if I’d written the IPTC metadata to the masters (as per Method 1 in the instructions), even without timestamp modifications, so it’s not *just* that. I tested re-importing the image from my camera and using exiftool to see when it lost the orientation, and it happened repeatedly whenever the master was modified by Aperture. I’m not sure how/why this is happening, and it may not be happening for others, since I’m sure this has been tested by a few by now, but for some reason the orientation data was damaged in my use case. Further to the orientation bug (which I’ve just noticed UltraBob has mentioned above), it’s worth noting that Lightroom doesn’t look at XMP sidecars for JPEG images (perhaps others too). Further, the only way Aperture exports GPS data is via the XMP sidecars. For RAW, I haven’t tested Orientation but Lightroom does pick up the XMP sidecars including GPS data, so Method 2 + XMP seems the best bet to avoid Aperture breaking anything. I’m not sure whether it’s worth pursuing Apple or Adobe for fixes/workarounds for JPEG users (e.g. Apple may not be interested in fixing the orientation bug, and Adobe may not care to deal with XMP + JPEG EXIF data). UltraBob’s workaround was to export twice, and write an exiftool script to copy the EXIF orientation from one exported set to the other. Aperture includes some metadata (keywords, names of tagged faces as keywords, and the usual IPTC data) but doesn’t add GPS so you’d have to use exiftool to copy that out of the XMP sidecar into the JPEG as well, if it was important. Yes, thanks for reminding me about JPEGs. They were mentioned in an earlier version of the article, but I must have removed the information when I revised it. You also need to write the IPTC to the Originals for other file types which shouldn’t have sidecars such as TIFs, DNGs. I must add my own thanks to the choir here. Great article, very helpful. One thing I am unexpectedly encountering is the unwillingness of the color labels from Aperture to make their way across in JPG files. I’ve tried all possible combinations of IPTC data move, sidecar files, writing directly and intently to the originals, no luck. Keywords and star ratings seem to be a non issue, but color labels seem to be ignored. Has this been your experience as well, or am I missing something? In fact I have recently been looking at the labels and flags issue, though I haven’t a recommended solution yet. It’s not really a standard field, so Aperture appears to write the word Red or whatever to one area of the xmp (Dublin Core dc:subject) while Adobe expect to find it in xmp Basic Properties xmp:Label. In the past I’ve encountered apps which save the colour label to both and more xmp fields, or others that read from different locations, but here Aperture writes it in one place, Adobe only look in another. One idea is to use Exiftools which, I think, could loop through all the pictures and copy the data from one field to another. That could take a while to write and a while to run, too geeky? Another idea is the script I mention in the article which copies the labels to keywords, making it easy to recreate the colours in LR. I’ll add the script to the article later if you want to try it. That’s great John. I figured it had something to do with how the data was written. Interestingly enough this only seems to affect JPG files, RAW files it’s a non issue. I think my workaround might be a simple quick identification of all JPG files with color labels, add a keyword, import to LR and use that keyword to reapply the labels in LR. The keywords could then be removed. The script is ready but I’m not near my Mac. Doing it manually won’t take you long. when I finished importing the photos with IPTC4XMP sidecar into Lightroom, can I delete all the IPTC4XMP sidecar files? Will all the metadata now written from IPTC4XMP sidecar files into Lightroom’s catalog? Yes, just like Aperture, Lightroom stores all your metadata and adjustment work in its catalogue. So you can delete all the sidecars, though I wouldn’t bother if it takes any time since they don’t do any harm. If you delete the sidecar files after the fact, and even restart Lightroom, the tag in the EXIF panel that says ‘Sidecar: XMP’ will still display. I don’t think you can get rid of that. Only by reimporting. Personally, I would just leave them – they do no harm. I’m not quite clear on something. When I export my Aperture library so it can be imported into Lightroom, do I need to export every project/album in my Aperture library individually, or is it possible to export the entire library in one go, and then reimport that library into Lightroom, with all the projects/albums intact? .psd files back into Aperture. Is it possible to preserve all those edited files in my switch over to Lightroom? You have a choice. It’s possible to export the entire library in one go, and I’d suggest that’s the best way to make sure everything gets into Lightroom. You’d only export an individual project as a test, so maybe for a dummy run. Those psd files will be fine in Lightroom. is there an easy easy way to clone the aperture behavior of creating and assign images to a project at impot? You’re right to see collections as equivalent to projects (and albums). Some people make the mistake of thinking folders are like projects, but it’s more a question of Lightroom having real folders plus virtual folders, while Aperture is entirely about virtual folders (the relocate masters dialog is as close as you get to folders). There isn’t really a way to assign images to a collection or automatically assign the IPTC job code. I agree it would be good to have. There is one way, but you’d have to create a metadata preset first and then apply that preset upon import (you might use a general copyright-setting preset). You would then be using the IPTC Job as your project name. Another idea might be to add a keyword during the Import dialog – something like Projects > My Project Name. Did they say that ? finally ! Thanks for your answer John, in the mean time i have solved my issue. There were some duplicate files in the folder i was trying to transfer (for some unknown reason, some files were marked as Jpeg+raw, a mode i NEVER use on my camera…. not the first time a folder gets corrupted in Aperture, so i am glad i am quitting) and that was apparently preventing Lightroom from picking-up the Sidecar files and the metadata with it. After a clean-up, it worked. I’ve now transferred close to 10k files and, finger-crossed, it’s all working well. Many thanks again for the very useful post. What’s the difference between exporting an original image and relocating an original image? I relocated my originals to date folders. Should I have exported them instead? Does the metadata copy over both ways? Exporting means a second copy of the file – one in a managed library/vault and the one for LR in a regular folder. Relocating is putting the original in a new folder, as you have done. The metadata carries across in each case but by different routes – exported files carry it in a sidecar, relocated files by saving the metadata into the file itself. Hi John, you have a great deal of patience, so thanks for all the help you have provided others. Any thoughts on how to get all of the various albums into LR from Aperture. I use many, many albums for each project, and since one picture can have versions in many albums I’d like to retain that information. Some of these albums are in their original projects, some are in folders elsewhere, etc. You probably know how albums could proliferate over time in Aperture, since that was a very efficient way of grouping pictures for a wide range of tasks. It seems that most of the migration techniques center on a simple way of moving pictures into folders in the Finder, then importing those folders into LR. Simple enough, but it really loses a whole lot of organization that was built up over time in Aperture. Also on star ratings, will it be necessary to take all star ratings and somehow add them as keyword metadata, as in “Jim’s One Star,” or “Jim’s Four Star” inserted into the keywords, so this can then be extracted and used in LR? Of course with thousands of projects, folders and albums this might be a bit of a job. Ratings should pass across without problem, Jim, since they are standard non-proprietary metadata and both of the two methods (above) would carry them over into LR. Albums, like LR’s collections, are proprietary and a bit more difficult. My initial thought is that they could be added to keywords, but Aperture’s Batch Change command doesn’t seem to allow you to copy from the album names. So I suspect an AppleScript will be the answer – see http://www.apertureexpert.com/forum/keyword-based-folderprojectalbum/9239 . I’ve a bit too much to do right now, but I’ll see if I can figure it out. Hi John, thanks a lot for this guidance which is useful to many people. – Now that i master LR (for what i use at least) i feel confident to start migrating all my pre 2014 projects from Aperture to LR. Those projects are in “referenced” folders for Aperture, so that should be easy. – Not being happy with the heavy-handed “Write IPTC to Originals” approach, and with sufficient disk space in hand (for now), i chose to export Originals onto a new folder, basically duplicating Masters files, trying both options : “Include IPTC”, which i understand would write the IPTC onto the raw files upon export, or “Create Sidecar Files”. – Then importing those pictures into LR using the Add option. – Unfortunately, with both options, i don’t get the Metadata (Keywords, star ratings) in LR. I do have the camera info (shutter speed, etc…) but not what i’ve added in Aperture. – In the case of “Write IPTC to originals” files, i’ve checked the files with Get Info option on Finder, and i can see the keywords there (i can’t see the ratings though, not sure if they show on Finder at all). I guess it’s even more helpful now Apple have said they’re stopping Aperture development! “- Then importing those pictures into LR using the Add option. One guess – you’re not applying a metadata preset upon import to Lightroom, are you? I’d also suggest examining one of the sidecar files using TextEdit. See if it does actually contain the keywords – I just tested one and could see them. All indications are that Apple has abandoned Aperture. Not ideal to be running 2 systems but much less hassle. In time, the need to access Aperture will diminish and Lightroom will take over. This issue does raise the interesting issue of longevity. Photographers would like to think that their best images will last forever – but we do need to be ever vigilant. I wouldn’t disagree much with anything you say, and in the past I kept iView running for a period after I had moved to Lightroom. So it’s a valid alternative. When you want to create a book or other project it may be more difficult to combine images from two systems. But one advantage is that you will have much more LR experience and find the task easier when/if you decide to transfer old images from Aperture. The guidance above is excellent and clear. Before exporting make you all stacks are opened, otherwise Aperture will only export the ‘pick’ photo. The easiest methods to use is to make sure that all your photos have been processed as you would like. Set up a folder in Pictures called Referenced Photos, then export your photos as large Jpeg versions into the folder. When you import into LR5 creat a Meta data preset for each of the sub-folders in the Referenced folder. You can then input each sub-folder separately at attach the correct metadata. If you have some photos which you think you might need to re-process then exclude them from the versions export process and export them separately as originals. PS – you could keep any photos that you think you might need to re-process in Aperture rather than export them to LR5. That’s not ideal,because it means your photos are on two different systems. How often have you had to re-process a photo in the past? If you’ve never had to reprocess then exporting pegs or tiffs seems ideal. If you export versions and input into LR you don’t need to keep the photos in Aperture. Keith. Very good point about the stacking, Keith. I think I’ll update my post. Thanks so much for this guide, it was very helpful. Can I please suggest an addition? I initially tried bringing in the materials using the XMP sidecar as I agreed with you that it would be much better not to modify the original file, but I’m going to be redoing it using export -> original but selecting to include the metadata in the file. The reason for this is the faces data. I have lots of faces tagged in Aperture, and that data doesn’t seem to get written into the XMP sidecar files, though it is written when embedded in the file. I have a feeling that a lot of people who have hung onto aperture as long as I have, may have done so for the faces feature, so I think that information would be a valuable addition to this article. 2) export in two stages one writing raw files with XMP sidecars, and one with everything else, writing the data into the file. I’m getting started on approach 2 right now. OK, here’s the last feedback I’ll leave on this, unless I write up a blog post about what I did to help others out. I discovered that writing non raw files with xmp sidecars just resulted in the sidecars being disposed of. Writing the itpc data into the non-raw files resulted in my faces and keyword data coming through, but due to what I can only assume is a bug, the orientation exif data gets reset, so I ended up with a ton of sideways and upside down images. Since I was importing close to 50,000 images I didn’t want to go manually rotate them. I discovered that non writing the itpc left the orientation correct, but left out the faces data that I wanted. I ended up exporting two copies of all the non-raw files, one with and one without itpc. I wrote a python script to crawl the entire directory structure I output, and replace the orientation data in the itpc files with that from the equivalent in the non-itpc files. Finally I was able to get my data into lightroom with the faces AND orientation data. If there is any interest I’ll probably throw my quick and dirty python script (which utilized pyexiv2) onto github if there is any interest. You can find me on github under the same username as I commented under here. I tried to contact you via Github but failed. Hopefully you’d be willing to share your script to automate the exiftool actions. I’ve tried doing this one-by-one with exiftool to replace the original orientation EXIF data, but that’s a bit tedious! Thanks!! UltraBob, is there any way I can see that python script you mentioned for getting orientation data into lightroom, alongside the IPTC data? I’d like to give it a shot. I’m a newbie when it comes to coding, but I figure now is as good a time to get better as any. I joined github but I don’t see said script under your profile. Let me know if I missed it. Thank you! I’ve been using Aperture 2, and it’s been working ok-ish, until recently when the search function refused to work. I’m debating upgrading to Aperture 3, which Apple doesn’t seem to want to update very quickly, or Lightroom, but I’m worried about that program going to the cloud also. Plus, I don’t seem to be able to import the Aperture library into the trial version of the Lightroom program. All my master images reside on various disks, there are no masters in my library. So when I go to import, I’m not even seeing the Aperture library in the import options. Did I try to do something that’s not possible or where did I go wrong? All I want is a searchable database, since I do all my processing in Photoshop. Adobe have said they don’t plan to limit Lightroom to subscription. Equally, don’t forget that the “driving force” of Adobe’s move to cloud subscriptions left the company in March last year – to join Apple. You don’t import the Aperture library – you import the images. You need to read through the methods in my post. hi, thanks so much for helping so many people! I have gone through the comments but can’t find my answer so here goes, sorry if i missed it somewhere. I have managed files, and I plan on method 2 of exporting File > Export > Originals with sidecar into new directories for my RAW+JPEG files. But if those files are then getting imported into LR, and obviously staying in place, why would I need to do the previous step in Aperture of making the managed files into referenced files? In essence I am making two sets, as you noted about hard drive space, but what does the first ‘managed’ set of images achieve if I am now in a LR only workflow. Why do I need them? It would seem to me I could just as easily do ‘File > Export > Originals’ with sidecar from a Aperture managed structure – since the end goal is that export with sidecar. I have tested with RAW+JPEG files with no GPS data and it seems to work, metadata imports. I have not tested with GPS data yet. Do you mind confirming if this workflow is problematic or acceptable in your view? sorry edit: I meant ! If you plan to export originals, you wouldn’t need to worry about making the files referenced – those are alternative methods, not steps. Leaving the managed files in place would only be useful if you wanted to go back to Aperture. Is it possible/feasible to use Aperture purely as a library/organiser facility and use Lightroom 5 for all developmental/corrective applications and, if so, where would/should the final images reside (in Aperture or Lightroom)? It’s a good question, and maybe I’ll copy this to my Q&A posts. It is possible/feasible, but maybe it’s making work for yourself? Lightroom would be unable to use Aperture-managed files, so you would first have to ensure the files are “referenced” in Aperture ie reside in regular Finder folders. The results of your adjustments are another problem. In Aperture you wouldn’t see the adjustments performed by Lightroom unless you exported the files from LR as TIFs/JPEGs and imported those files into Aperture. OK, there is one other way, converting the raws into DNGs and telling LR to Metadata > Update Previews. That updates the JPEG preview that is in the DNG and you can then use Aperture’s preview mode to view them. I’d rather not have sidecar files hanging around in each subfolder. If I export in Aperture with the “Include IPTC” metadata option, will Lightroom still be able to read metadata (including GPS)? I could be wrong, Craig, but I thought the “Include IPTC” metadata option applied to non-proprietary file types such as TIF, JPEG. If your originals are proprietary raw files, you’d have to export with the sidecar files – otherwise you wouldn’t be accompanying the raw files with any metadata. You can always delete the sidecars later – a Finder query can look for all the *.xmp files in multiple fdolders. Im looking into moving to LR5 but i dont want to loose my aperture edits. My plan is use the export versions option. What file format and setting would be the best to use? Jpeg and maximum quality? Would i be able to use that file for developing photos? Personally I’d use 16 bit TIF, which would be more robust for further adjustments, but in the big majority of circumstances you wouldn’t have a problem if you went for Jpeg and maximum quality. Assuming you import the raw files into LR, make sure either the JPEGS are named differently (eg add a prefix like “-ap”) from the raws if they are in the same folders. If you don’t do this, LR will think you shot raw+jpeg. Interesting and very in-depth post. I have been an Aperture user for a couple years and have only very minor complaints. Overall I love it but ALL of my pro photographer contacts use Lightroom. First of all, why do you think that is? And second, I’m a tagging maniac with hundreds of keywords, every photo rated, crazy about smart folders, etc. I do most of my adjustments in PS which are saved as TIFFs, not in-house. With over 100,000 images and hundreds of carefully labeled projects, is the switch worth it in your opinion? I very much would value your feedback. As you are happy with Aperture, Max, I think you are fine where you are. I obviously prefer Lightroom, but I think it’s fair to say that for every feature that you might like in Lightroom, I bet there will be others which will make you regret leaving Aperture. In Lightroom you’d probably appreciate the value of its lens/perspective correction, adjustment history, before/after split adjustment view, dust spotting, keyword synonyms, direct control of photos’ physical locations. On the other hand, Aperture’s smart folders are much better than the LR equivalent, and I’m a big fan of preview mode, the loupe, list view, its slideshow is much better (I export JPEGs from LR and build slideshows in Aperture) while book design is more flexible. So if you are happy where you are, I doubt the effort to move would be worthwhile. Of course, nothing stops you trying the other and seeing what benefit it may have for you. As for your pro photographer contacts using Lightroom, it’s hard to know. It may be just chance, or it may be you happen to know guys in a market segment that favours LR (Capture One is big with studio shooters while PhotoMechanic is popular in press environments). It’ll be a few factors. Partly I think Apple dropped the ball – 3 included faces and places when pros wanted Adobe’s better high ISO quality, lens corrections. People do tend to go with the big battalions, which on an individual reason means your friends use the same software and you can learn from eachother. Perhaps too the marketing pull of “it’s from the Adobe Photoshop guys” is just that little bit stronger than the Apple promise that its software must run better on its computers? Thanks for this! This helped greatly today in a somewhat emergency transfer. I mistakenly relocated ALL originals instead of only relocating MANAGED originals in Aperture. Because I had all of my photos organized by year, month, and event on my hard drive, this relocation removed all of my photos from those organized folders and placed them into new folders by Aperture Project Name (which is what I’d hoped to only do for the managed files). Is there a way to “undo” this relocation and get them back in the folders from which they were originally referenced, or am I up a creek? Thanks for any assistance you can lend. Hi… I’ve tried both methods but my star ratings are not showing up in LR3 after import. My keywords transfer, but I really need those star ratings to come over too. Any thoughts? Is there something I’m missing? Hard to say without looking over your shoulder, but star ratings should come over OK. Coloured labels are more troublesome as there are a number of different ways in which programs record them. John… thanks for the quick reply. After trying many tests I have only been able to get the metadata to stay with my jpg files by “exporting “version”, thereby creating a new jpg/tiff. Will make the process a little more work, but its a solution. I’m new to LightRoom and I followed the instructions (first part through relocation) and after the import there was no reflection of the subfolder scheme that I wished to be transferred as well. How do I find the photos? I did the move from A –> L and it worked great. Used the Relocate Master option. I do value my work as a part time photographer but have decided to bail Aperture. Sure Apple’s application is nice and works well and I have used it for years, since ver 1.5, but I prefer the work flow from Lightroom. Besides I use several other Adobe products and they all have a similar interfaces. I have lost my edits when I switched to Lightroom but it’s a short time pain for long time gain. It’s kinda like having a weird flood or strange fire and only wiping out my edits. I still have A on my drive and may reference back to it but I doubt it. First of all thank you for this article and all your advises. I have decided to convert from Aperture to LR 4 and will do it 100% meening that I’m not interested in the future to change tool …I only want to use LR. I have all my Aperture photos on an old computer and want to move them to an external harddisk in wich I want to store all my photos. Currently this harddisk (disk 1 in the following) have stored all my ‘not Aperture photos’. In disk 1 I have a year/month/day structure. In Aperture I only have jpeg’s. As I understand all the discussions it’s not possible to have GPS data in my convertion to LR. Is that right understood? My plan is to follow a mix of method 1 and 2. Method 1 because I only have jpeg’s and Method 2 to make an export away from my old computer to an external hard disk (disk 2 in the following). After this I’ll bring the disk2 to my new computer and will import to LR by using copy or move – in the import dialog – to disk 1 in my current structure. Will this be the right way to do this convertion? In advance thank you very much. I’m about to move around 15,000 images over to LR4 from Aperture. Many of the earlier images are scanned from film JPG masters with minor edits. Starting once I got a camera that did RAW, I have all RAW files. I know I can’t move the adjustments over, but what I would like to do is have the file pairs be such that the edited JPG is what is shown, but I have the option to go back to the original RAW or JPG if I want to start over with edits. Normally, I wouldn’t do that, but I do occassionaly go back and redo a photo if I get a new tool, or I learn a new technique that could improve it. Aperture provides a way to swap which file is the master (use JPG as master or use RAW as master). Does LR4 have something similar? Since some of my files are JPG master + JPG edits, am I limited to a stack approach? I’m guessing that auto-stack isn’t going to work because the times on the files will not be close. Note, I really would rather not keep everything in Aperture around because I’m guessing that will end up causing me headaches if I change things somewhere. Plus, I really don’t want to go back and forth between tools. I plan on making a clean break. There’s no automatic way, Dave. Auto stack may work, but it’ll generally assume that the raw file should be on top, Maybe someone has written a plug-in to automatically import both with the JPEG stacked on top, but I’ve never seen one. Thanks for the info, John. I think I will treat my originals no different than I did with negatives and slides vs. prints. I am in the process of switching. I am currently exporting my photos from Aperture with “external” xmp files. I havent imported them but can I delete the xmp files once everything is imported in Lightroom? It’s quite messy with all these files hanging around. Yes, you can delete those files. Personally, I’d just leave them and occasionally update them from LR. They don’t contain all your LR work, but can be an emergency (and only second-rate) backup. John, you are most patient, considerate and helpful as seen by the above, thanks! I’m total newbie to LR, been with Aperture thru all the initial teething to what was a very good product–but now they combined iPhoto and Aperture libraries into a common structure that for me at least, not sure about others, has gotten royally screwed up. My 100,000 photo Aperture library has large holes, especially in the 90 most recent 2012 projects, around 30k photos. Doing all their fixes has only made the problem worse, so that now I can’t even open the library. In the past year they’ve gone thru 3.1, 3.2, 3.3 and now 3.4 still not fixed but worse. I’m very tired of it and hope LR is the escape. But now I can’t go back with my back up to a stable library of what to me are very valuable photos. All have been managed not referenced. So the question is, how to get my files out since I’ve been forced to continuously upgrade both files, backups (vaults) and the program? And while I’m at it, hopefully eliminate the many duplicates there. I work primarily in Nikon raw (nefs). Thanks. Funny, I’ve never thought of myself as patient! I think I’d ask yourself how much of a LR newbie you are? One approach might be to get processing all 2013 pictures through Lightroom and become familiar enough with its differences that the migration of older pictures becomes much easier. The grass isn’t always greener, so proceed at a sensible pace and take plenty of backups. Not being able to open the Aperture library sounds pretty horrendous. Fixing this would make the move much easier. What steps have you taken to open it? Sometimes, for example, there may be a small lock file that would normally be deleted upon closing the program. But if that deletion fails to happen, it then locks you out. The other thing that often goes wrong on Mac is the preference file, so do you know how to delete this? You might then be able to restart and change the files to referenced. Are you close enough to an Apple store that you can book a genius session? Getting your library readable is your first route. In the worst case, it will be possible to get to your photos. When files are managed, Aperture stores them inside the aplibrary file. This is what Mac calls a “package” file, so you can ctrl or right-click it in Finder and choose “open package”. From then on, you can go down into its folders and your pictures will be in there. So you should be able to move them to regular Finder folders. For now, don’t do it – just explore. I find that Aperture’s Masters are substantially smaller than the originals, but the original can be recreated by exporting and including the IPTC metadata (the size of Master plus the size of an exported sidecar is still a good deal less than the original JPG image). and this blog post discussing it and a couple questions that you may have going through the process. Again thanks so much for such a great walkthrough. I have been considering Aperture to LR for a while and have not seen it laid out as well as you have done. I utilize managed not referenced. I have all of my photos in “projects” named by event such as “Spain 2008”. So I understand how to export masters with side car files into folders with matching names. By using the named folders I guess I will not be able to use the date based LR system. Or, I guess I could if I wanted to move away from the named folders. If I was to change now would be the time. Is it true that as I add the files to LR I need to specify if I want to keep existing folders or go to date based? As you can tell I am a little confused. @JohnD Yes. When you import into LR you get the choice of “Add” which leaves files where they are, and “Move” or “Copy” which would allow you to go date-based. My inclination would be to “Add”, leaving older folders in the project structure. Import new pictures into date-based folders. After a short period, you should be able to decide to leave these folders in this way – or have the experience to change to a purely date-based structure. I would like to migrate from Aperture to Lightroom. 99% of my files are .jpg already and wonder the best way to import them into Lightroom with their current adjustments. Pretty well following the article, Anne. I know I talk about raw files, but it applies to JPEG originals too. But you then mention “with their current adjustments”. There’s really no way to do this other than exporting versions – ie creating new “worked” or “adjusted” JPEGs. I would probably create a smart album of all items in the Aperture catalogue with adjustments, then export them to one a folder called something like “Aperture adjusted JPEGs” and broken up by date. I’d also ensure the filename has a suffix so it looks like “DSC_1234 ap-adj.JPEG”. Both these details will help you identify that they aren’t originals. Now, import the “Aperture adjusted JPEGs” folder into LR and do something more to distinguish them – eg give them the purple label. So by this point, your LR library would consist of folders with the JPEG originals, and the Aperture-adjusted JPEGs. While that allows you to find and print these adjusted JPEGs, it is of course rather ugly. A slight variation might be to import the original and adjusted JPEGs pictures into LR using the Move or Copy options in LR’s import dialog box (choose Copy if you want Aperture to know where the original JPEGs are, and have enough disc space). This creates new dated folders, so each folder would consist of a mix of original and adjusted JPEGs. How do those ideas sound? I originally sent this the other day, but it said it was awaiting moderation. Then it wasn’t there. Anyway… My question was about the metadata that is originally with the raw files when first imported into Aperture that included aperture, shutter speed, ISO, etc. Do I need to either write the IPTC to master or do the XMP sidecar option before I import them into Lightroom in order for Lightroom to see that info? I’m not worried about keeping any keywords, etc that I may have entered after importing them into Aperture. Thank you for your help as well as this very instructive article! Sorry, Melanie, I was a bit slow going through approving comments. This information is EXIF data and is added to the raw files by the camera – Lightroom will automatically read it. The writing to master or sidecar is only for IPTC info like keywords. I am about to migrate from Aperture 3 to LR 4. As far as the metadata, do I need to do either the write IPTC to Master or the XMP sidecar for the IPTC information if it’s just the IPTC information the was with the raw file upon original import into Aperture (like the aperture, ISO, shutter speed, etc.)? In other words, if I didn’t add any keywords etc. (or if I did, I really don’t need them in Lightroom) after the raw files where in Aperture. Thank you for your article on how to do the migration. Thank you for your helpful post. I am going to try to export masters with the IPTC embedded and ‘add’ them to LR4, as you’ve suggested. In addition, Is it possible to preserve my adjustments by exporting as well as jpegs and then somehow have the jpeg ‘sit on top’ of the master, like Aperture does Raw+jpeg? Also, I shoot in RAW+JPEG. Will that be a problem with your method? Yes, you can do this, though not quite as easily as you may wish. It’s also more difficult because of shooting raw + JPEG. Dealing with raw + JPEG first, LR usually displays only the raw but also manages the JPEG in a hidden way. So if you move a raw to another folder, LR will also move the JPEG twin. There is also an option (Preferences > General) to import these JPEG twins and treat them as completely separate files. Now, if you didn’t shoot raw + JPEG, I would probably advise you to export your Aperture adjustments as JPEGs to the same folders as the raws and with matching filenames. You could then choose the separate files option and use stacking. In your case, raw + JPEG makes that harder. My intuition is that you should export the Aperture adjustments as JPEGs but with a matching filename plus a suffix like “ap-adj”. I would recommend you test this – I’d be interested to hear how well it works for you. Thank you John. I’ll let you know how it goes. I am in the process of migrating from Aperture to Lightroom 4. Your article is very helpful. However, I still have some questions on the migration process and would appreciate if you could help. I am able to relocate originals (in RAW format) stored in Aperture to an external hard drive. Like you indicated in your article, importing them into LR is straightforward. That’s right, Duy Le, you’d have to use Export Versions if you want to see those adjustments in LR, as extra files. Alternatively, note my advice about “leaving the new ex-Aperture folder structure exactly as it is, and never renaming or moving any of the files or folders that are in there” so you could always depend on Aperture for its adjustments. Thanks for this guidance. I have one query. I’ve tried both the ’embedded in master file’ and ‘sidecar’ method (from Aperture 3.4) and all works fine except that not all ITPC data is imported into LR4. I get keywords, but don’t get Title, Caption and others. Any suggestions? I can’t think why this may be happening, Nigel. When I have this kind of problem, I’ll study one image in detail. One possibility is a conflict between the embedded metadata and the sidecar. With a raw file, I think Lightroom assumes the sidecar has the correct info. With file types where it expects the metadata to be embedded (JPEGs, TIFs, DNGs) it treats the embedded metadata as correct. So review that test image in Aperture and ensure that the title and caption are indeed there, and also open the sidecar in TextEdit and check it too. Remember too Lightroom’s Metadata > Read Metadata command. And one last possibility (risk) is that you have Lightroom’s automatic xmp preference switched on. For now leave it off. I have read your solution to moving from aperture 3 to Lightroom. I have Aperture 2 and was wondering how I can write IPTC to Masters. When O transferred the photos on my laptop I found that they only transferred jepgs and not raw images. How can I avoid this on my desktop? Anne, unless I’ve forgotten something, Aperture 2 didn’t allow you to write IPTC to masters. You’ll have to follow method 2 – export masters. As for JPEGs, this shouldn’t happen with Export Masters. Are you sure you’re not choosing Export Versions? How are you sure it’s exporting JPEGs? Certain you’re not seeing the files in Lightroom without adjustments? You should check exactly what you’re doing here. Hi John, Thanks for this post. I’m in the midst of transfering some earlier Aperture work into LR3 and I’m doing the step of ‘relocating masters’ and I’ve noticed that even though my original files are raw it’s transfering into jpg’s..anything I’m doing wrong? I like to work with raw all the way till I export to print..
please let me know how I can solve this. That should not happen. Relocate Masters simply relocates files – I’ve never heard of it changing their format. So before continuing I suggest you carefully review the masters which Aperture is trying to relocate. Are they really JPEGs? Has the Aperture library got both the raws and the export-to-print JPEGs, and are you relocating the latter only? Do you should raw+JPEG? You’re going to need to look closer at the masters. Hope this helps. Hi, Anyway to keep the Folders inside of the Projects? those are what I need. Jesse, You’d have to ensure that Aperture exported them as Projects and Folders. I think that should be possible in Export Originals where you can choose the folder name. Best to experiment. Assuming Aperture can export them that way, Lightroom would respect it. Fred, “Listed by dates in Lightroom” strongly implies that you chose “Move” or “Copy” in Lightroom’s Import dialog – not the “Add” that I recommended. “Add” imports them where they are in your Finder folders. Another possibility would be if you exported the originals from Aperture, in Aperture’s Export Originals dialog you chose date-based folders. In looking through the photos that LR is allowing me to ‘add’ there are some intermixed that are shaded and do not allow me to mark them to add. Why? How do I fix it? Thank you for the help! They’re probably already in LR – that’s what the shading in the Import dialog indicates. There is a Do Not Import Duplicates box on the right side, but I’d recommend looking at some individual images and confirming what I suspect. How do you determine which images did not transfer, and how would you fix that? Lightroom says there are 13,369 images possible to add and I have 13,603 in aperature. I have not done the final ‘adding’ into LR yet. I used method 1. Also, why do some people say to ‘copy as dng’? You are going to have to look at the detail. For example, does the 13603 include any versions? Maybe create a smart album in Aperture to list only masters/originals. What about managed files? Sure the 13603 doesn’t include any? Then like any data migration you need to break things down – how many TIFs are in LR versus how many in Aperture, then the JPEGs, PSDs…. You often find one category of pictures has a difference and reveals what hasn’t worked correctly. Treat the DNG issue as something totally separate. I am a supporter of DNG and recommend it generally, and might recommend it if someone really insists on using LR and Aperture, but I don’t think you should contemplate it until you’re sure you’ve migrated everything properly. Can I keep using Aperture for importing and file/library management and have Lightroom recognize my new imports automatically (I am searching for a permanent Aperture/Lightroom symbiosis)? It’s possible – but I suspect the effort would outweigh any advantages. You would have to import into Aperture by reference, and import into Lightroom as well. In LR you would select the folder where Aperture imported the files and use LR’s Folder>Synchronize command to bring the files into LR. Not automatic, but not too much work – until one then starts going into the details. You’d have to decide the tasks you want to do in each program and determine how to accomplish each one. Adjusting raw files in LR would mean you wouldn’t see the adjusted images in Aperture – so you might use DNGs in LR, and Aperture’s preview mode which would see the adjusted previews. Or another example, I’m almost totally Lightroom but I prefer Aperture to create standalone slideshows. So I export JPEGs from LR and use them in Aperture. Afterwards I could simply trash the Aperture library. But that’s a one-off exercise every so often, not an ongoing symbiosis! I followed all the steps, and i believe “masters” are now called “originals” in aperture. So, I exported all my originals and created IPTC4XMP files. Everything exported fine, however, when i add/import them in lightroom… All adjustments are gone. Help please! Jeremy, you’ll not be able to see any adjustments and I do say that “While Lightroom can’t read Aperture’s adjustments, it’s important to know that your keywords and other IPTC data are not trapped in Aperture.” There’s nothing that can be done about that with raw files, but are you using JPEGs or TIFs? So the only organisation in Lightroom are folders and collections? Aperture seems much more powerful in this respect, having projects/folders/albums/smart albums etc. Not really, Darren. Aperture’s projects/folders/albums are all just virtual folders, like Lightroom’s collections which are multi-functional. So a collection can be a project, if you want, or an album or (virtual) folder. In addition, Lightroom has the folders panel which allows you direct access to physical folders through the standard UI – not through a “relocate masters” dialog. So Aperture offers only virtual folders as organisational tools, while Lightroom offers both virtual and physical folders. The downside of system folders being available is, as you fear, that some people can keep using archaic ways and try to categorise their pictures with the folder system. But you don’t have to do so – I certainly wouldn’t – and I know of some people who actually hide their folders panel. Smart albums are much better in Aperture though. They can query more of the metadata, including adjustments, and I like the way they hang off the project or album. In LR you have to hard code the folder/collection into the smart collection’s criteria. I’m also considering migrating from Aperture to Lightroom, but I currently have my photos stored in reference, following the year/month/day folder structure format. However, my projects, folders, and albums in Aperture won’t be able to be converted to this structure in Lightroom to my understanding. Can anyone guide me to the right direction for migrating to Lightroom 4 but somehow I can continue to use my project/folder/album structure? Thanks. If you wanted, you would be able to export everything in projects, but in my view the year/month/day structure is the ideal folder structure and I would be reluctant to change it. In Lightroom you could reconstruct the project/folder/album structure as collections. Directly transferring is is harder, but not impossible. My inclination is to see if we can transfer that information to a standard IPTC field like job, and I’m pretty certain that can be done. Maybe you know how already, or this post looks promising, but I’d have to investigate. What I’m thinking is that we could copy the project name over to the job field. One might even make job equal to “My project – folder – album”, though I can foresee complications. When you then do the migration, the project would be found in the job field. how does that idea work for you? Thanks for the response, but it was a surprisingly disappointing response. I think you’re dangerously underestimating how much photographers value their work. Myself, and surely many others, also strongly disagree with your statement that, “So it’s not quite as difficult to escape from Aperture as you might have feared – surprisingly for Apple, they made it rather easy.” In fact, you’re the only person I’ve ever seen or heard say that it’s “easy” to switch from Aperture to Lightroom. To the contrary, most people find it confusing and highly risky, and there are tons of stories of collections being lost or messed up due to trying to go from Aperture to Lightroom. So would I really have gone to the effort of writing and updating these notes if I didn’t think photographers cared about their pictures and associated metadata? Migrating from one program to another is challenging, and yes it is risky, but you have to see this in the context of how difficult it can be. You don’t have to believe me, but I’ve seen plenty of migrations more difficult than this, where it’s impossible to extract any information. To their credit – and I don’t think it’s their default behaviour – Apple have made it perfectly possible to extract all your IPTC metadata. Sure, there’s not many step by step tutorials out there, probably for reasons like you suggested, and if you don’t know what you’re doing you can hit the rocks. However, follow the guidance I’ve set out and the move is somewhere between easy and “not difficult” – and notice the very first instruction is to confirm your backup is so solid that you can get back to where you began. I’m also confused by the statement that: “Lightroom can’t read Aperture’s adjustments…” Does that mean you’ll lose all of your edits if you move your photos from Aperture to Lightroom?! If so, that’s a huge negative that should be made much more obvious. It doesn’t deter most people, and it might be fairer to say that people would be surprised if the adjustments could be read in other apps. If you follow my advice about the “ex-Aperture” folder structure, you can always open Aperture and output the pictures. Alternatively, you could do an Export > Versions and create TIFs / JPEGs with your Aperture work baked in. You should note here that if your files are .jpg or .tif then you have to write the metadata to the master file. Lightroom won’t pick up the metadata on import from sidecar files if the files are .tif or .jpg. Good point. In an earlier version of this article I recommended a separate workflow for those types of files. These instructions sound great but I am slightly confused on the association of the keywords and IPTC metadata with the newly created Lightroom catalog. 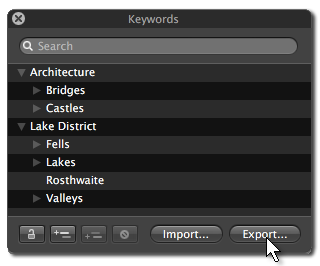 3) You suggest using File > Export Masters from Aperture to be able to grab the keywords and IPTC metadata. This action creates a new folder structure of the masters and the sidecar files. How can I get those associated with the Lightroom catalogue I created in (2) above? Sorry if I’m being dim and missing the obvious, but I am not clear on this step. I’m not sure if I was clear that it is either the Relocate Masters route, or File > Export Masters. They are complete alternatives. In your points 1 and 2, you’ve understood the Relocate Masters method. So do that in Aperture, then still in Aperture select them all and Metadata > Write IPTC Metadata. This will allow LR to pick up your Aperture keywords and other IPTC metadata – just import the files into your LR catalogue. This would be my choice providing you are OK with Write IPTC Metadata writing the metadata directly inside your raw files (and have solid backup of your raw files). Export Masters is the safer way, because it puts the metadata into XMP sidecars. Its downside is that it creates a new folder structure which isn’t in Aperture, so it uses more disc space. You then import these folders into your LR catalogue. Is that clearer? Far better to ask first! Your introduction to the this article makes moving from Aperture to Lightroom sound like a step forward. However, based on revising numerous forums and reading the posts a lot of fellow photographers struggle with an application that is extremely cumbersome, lacks Aperture intuitiveness and is not at all user friendly. File handling and importing photographs is one example where, when using the two applications in parallel, i found that LR was particularly poor and failed to handle impost from several cameras spanning the same dates. By the time I had sorted the mess that Lightroom created, it took me 5 times longer to import the same photographs into LR than into Aperture. So in many ways using Lightroom strikes me as a big step in he wrong direction and certainly is detracting greatly from the fun and enjoyment of photography.